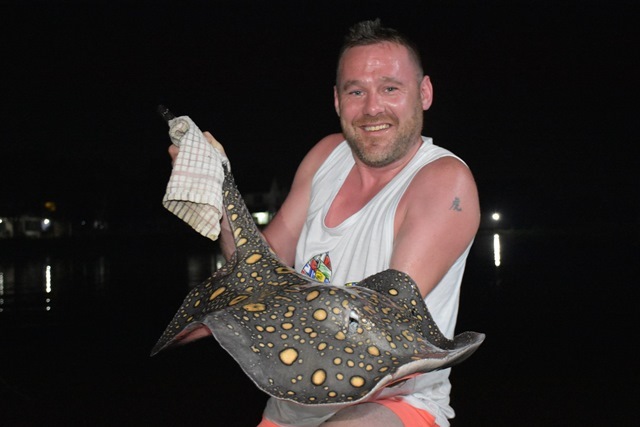 Regular Palm Tree angler LeeDunkerley brought his mate Gareth Martin for his first visit during the month. 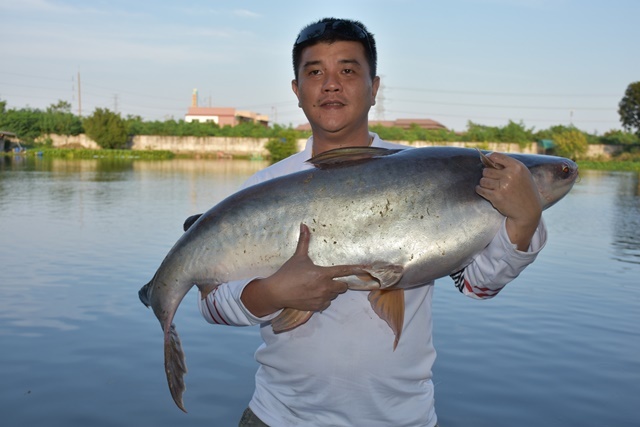 And, what a wonderful visit he had topped off by a Siamese carp that well exceeded the ton mark. 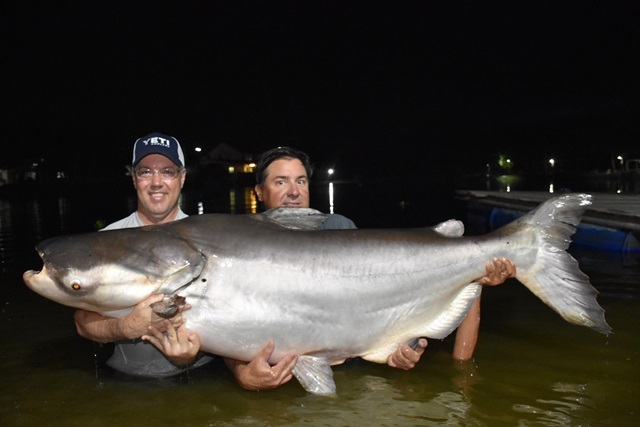 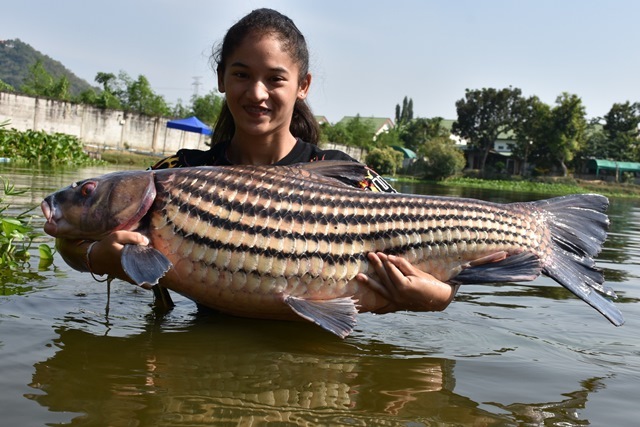 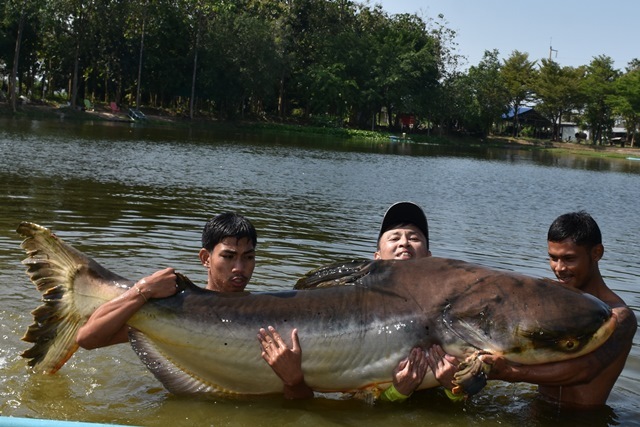 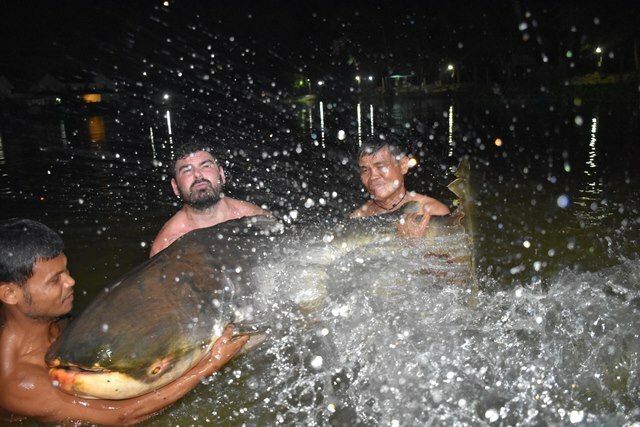 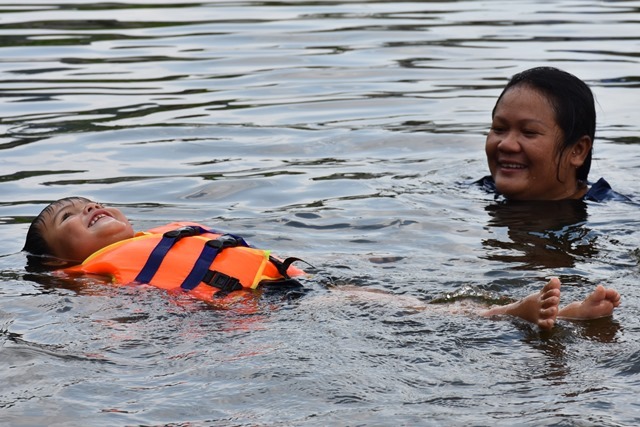 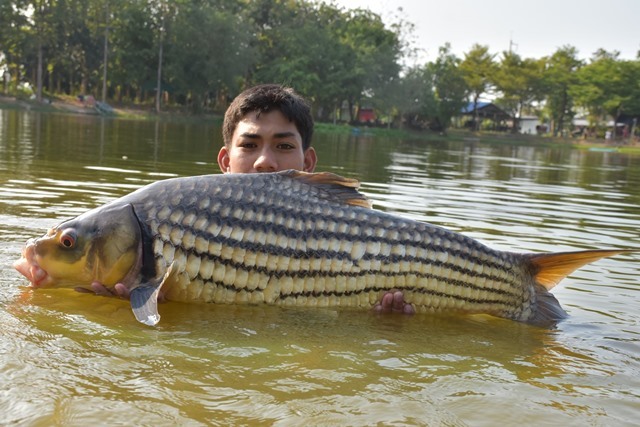 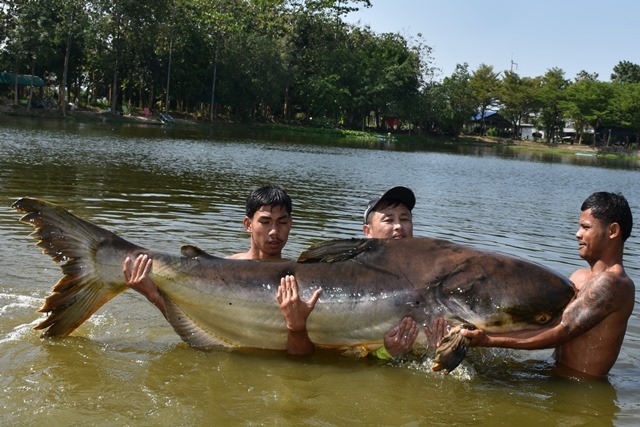 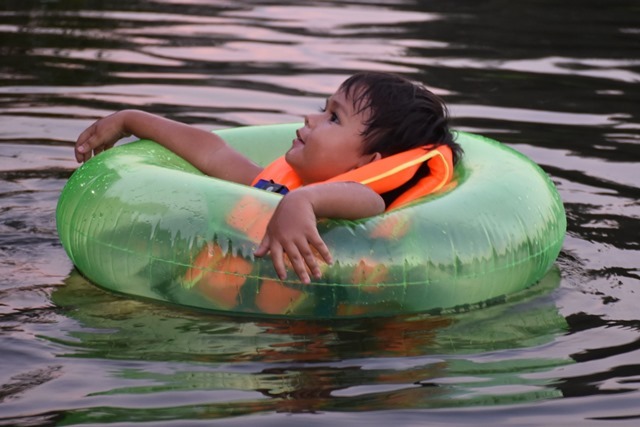 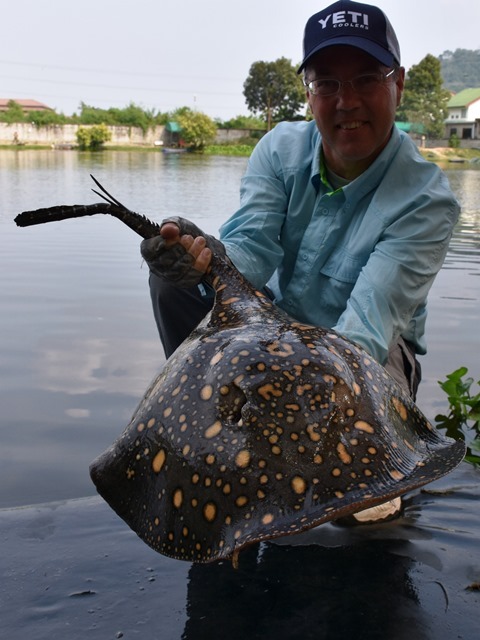 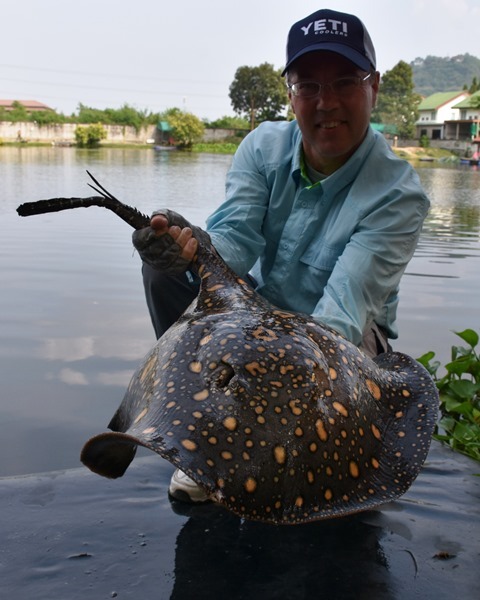 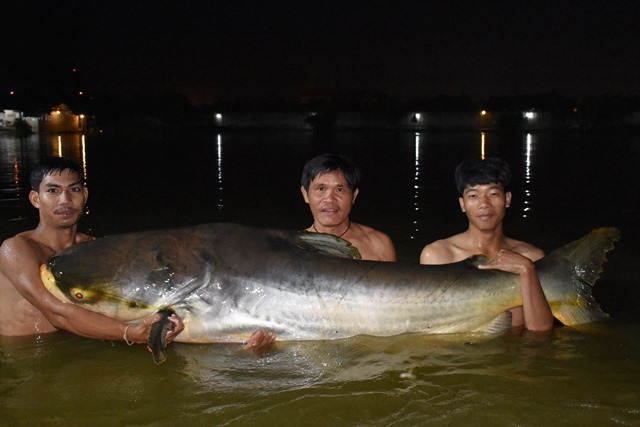 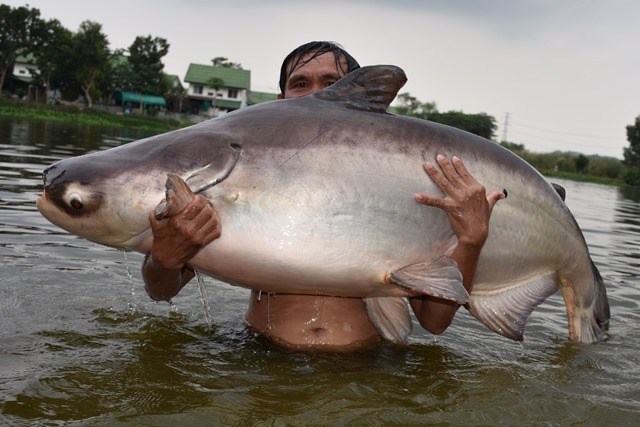 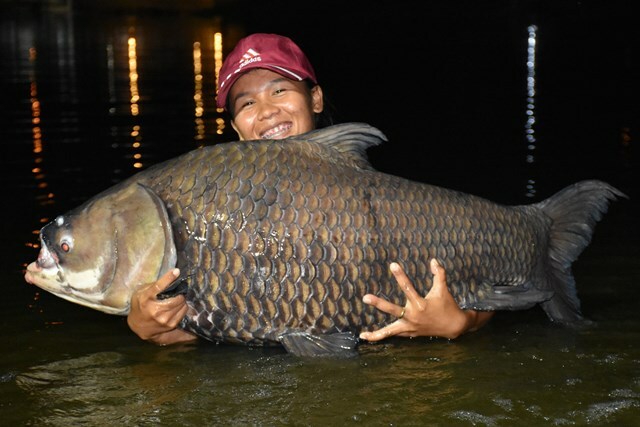 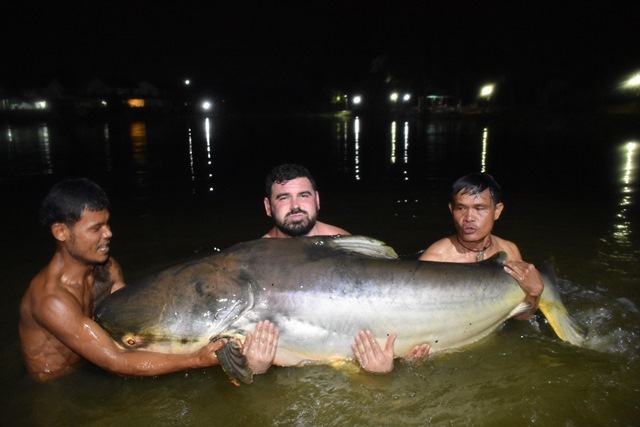 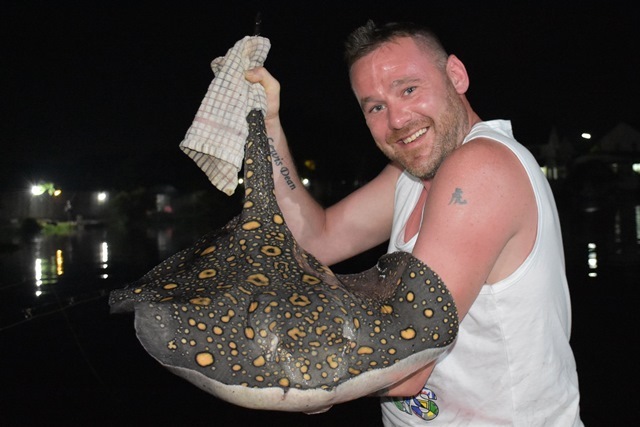 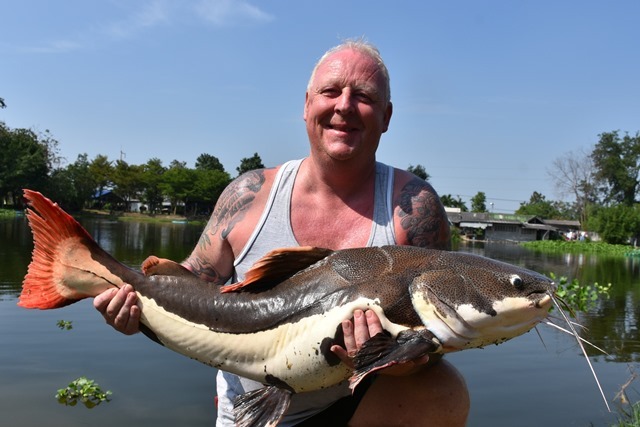 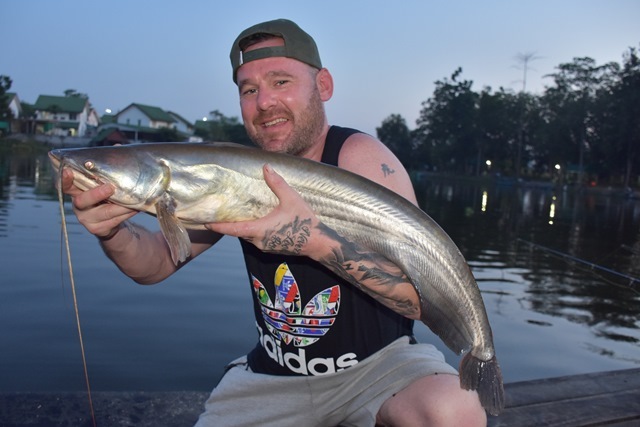 They also landed a rarely caught motoro stingray, chao phraya catfish, wallago attu, leopard catfish, spotted featherback, clown featherback, alligator gar, striped catfish, yellow catfish, and Asain redtail. 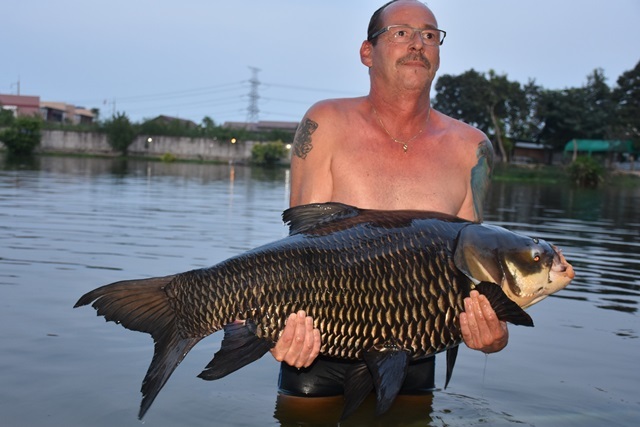 Klaus Fix had a great session becoming the latest member of the Palm Tree Lagoon BIG Carp Club with a truly awesome Siamese. 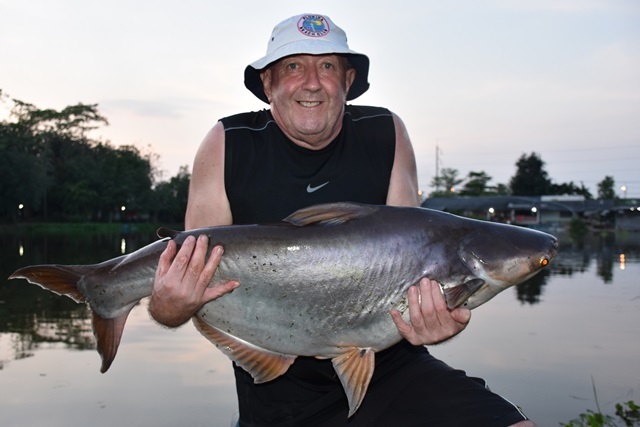 He didn't stop there going on to catch some other superb fish that included Chinese bighead carp, tambaqui, big-Y catfish, chao phraya catfish, striped catfish, catfish shark and both Thai and Amazon redtail. 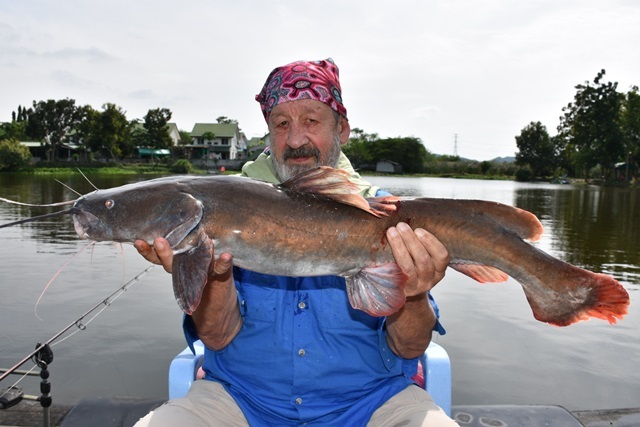 The legendary Terry Eustace was back unfortunately the carp fishing was a bit slow due to the inclement weather but he still managed to catch a variety of other species like black shark minnow, Salween rita, alligator gar, black ear catfish, wallago attu, Mekong catfish, rohu, catfish shark, big-Y catfish, suckermouth catfish, striped catfish as well as both Asian and Amazon redtail. 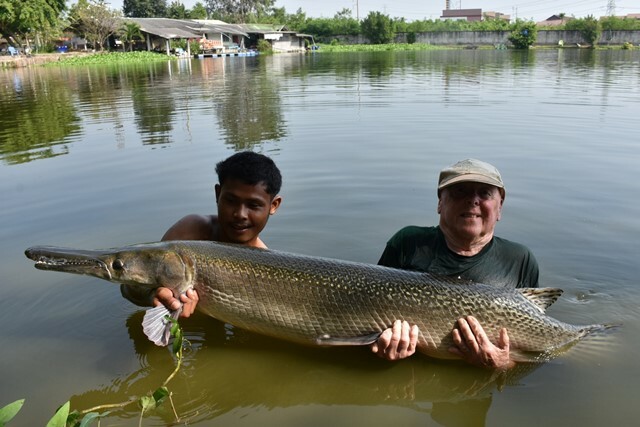 Claude Resch and his fishing buddy were more than happy with their first experience at Palm Tree Lagoon catching some impressive fish like giant snakehead that rarely get caught, yellow catfish, spotted featherback, clown featherback, Siamese carp, wallago attu, alligator gar, the 'Friendly Mekong', African walking catfish, striped catfish, and both Thai and Amazon redtail. 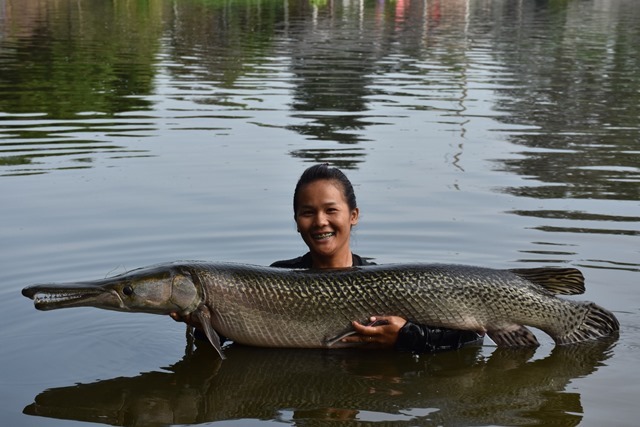 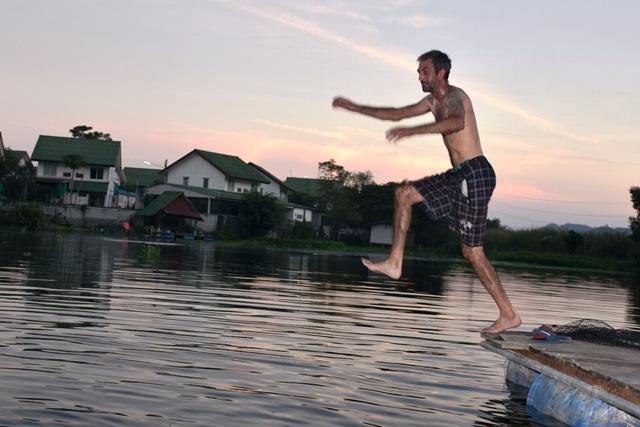 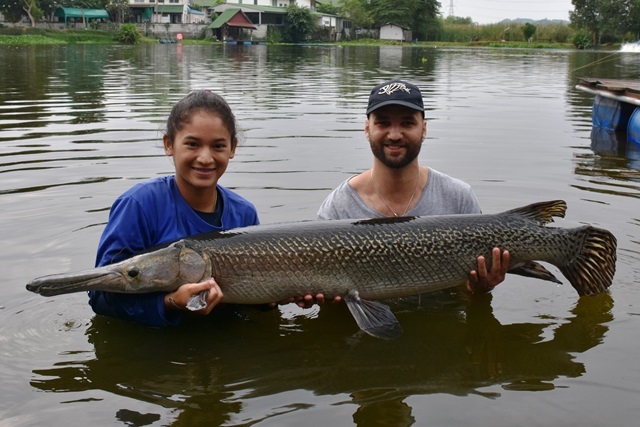 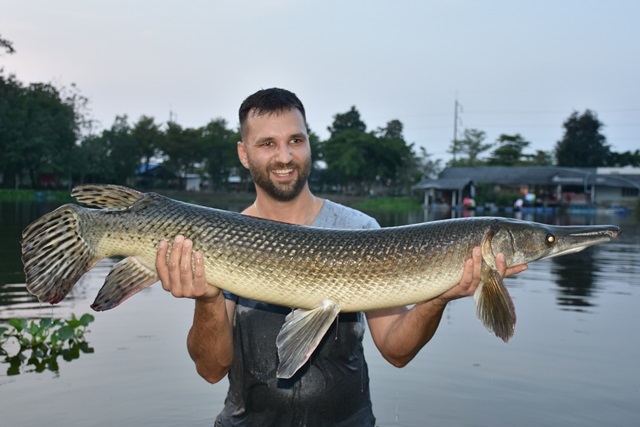 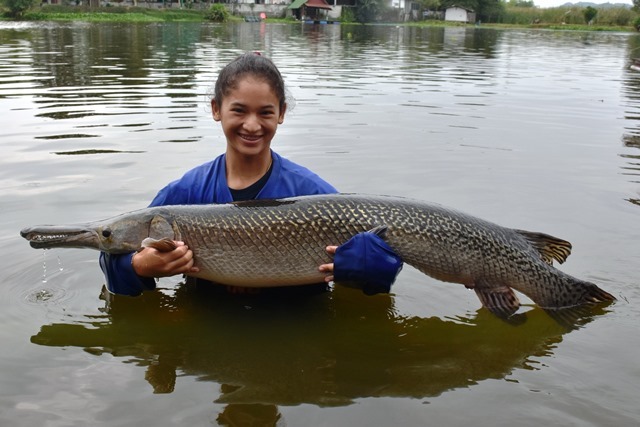 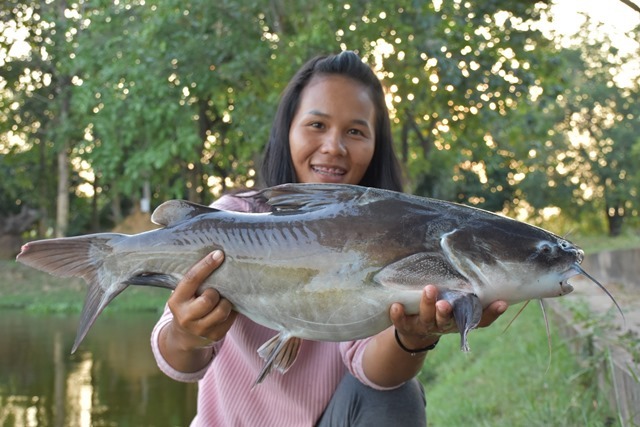 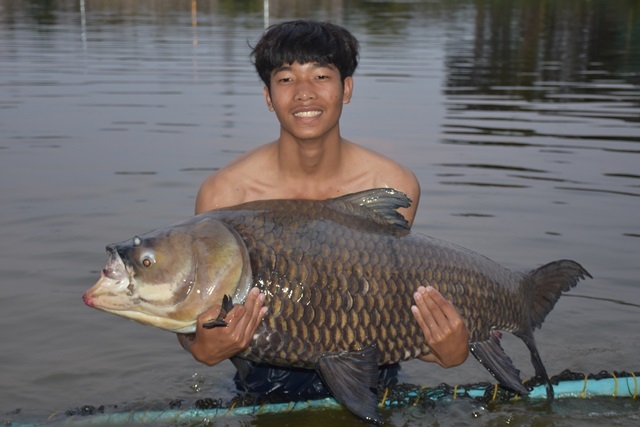 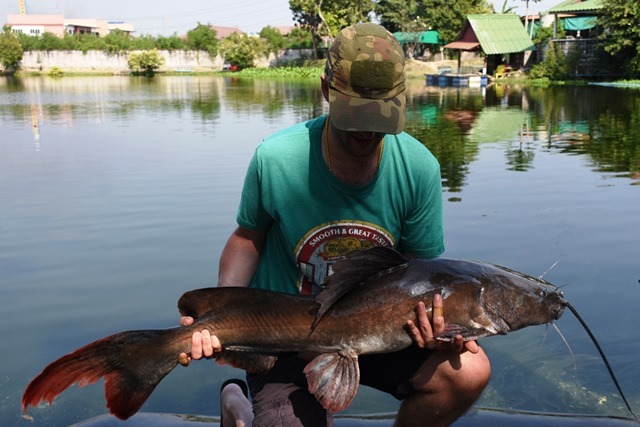 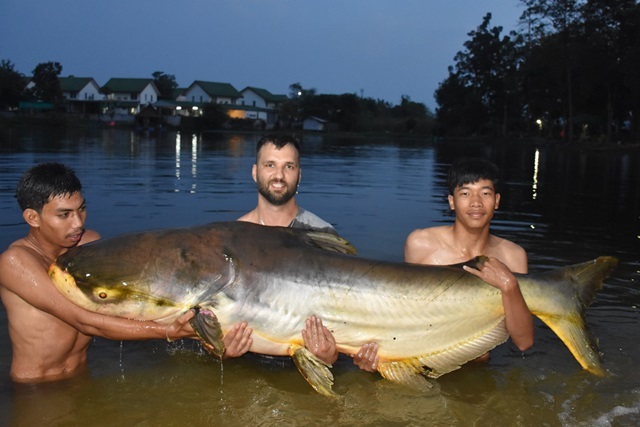 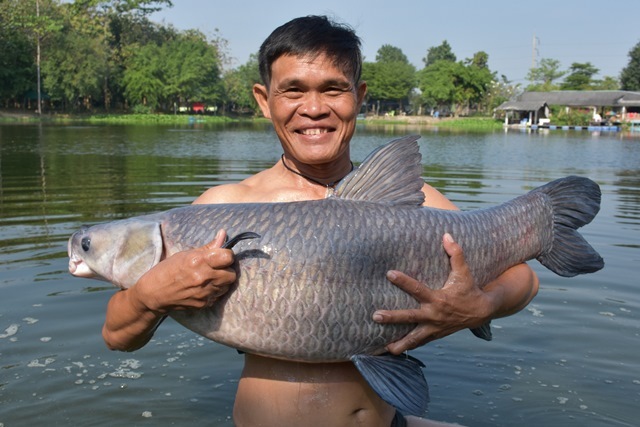 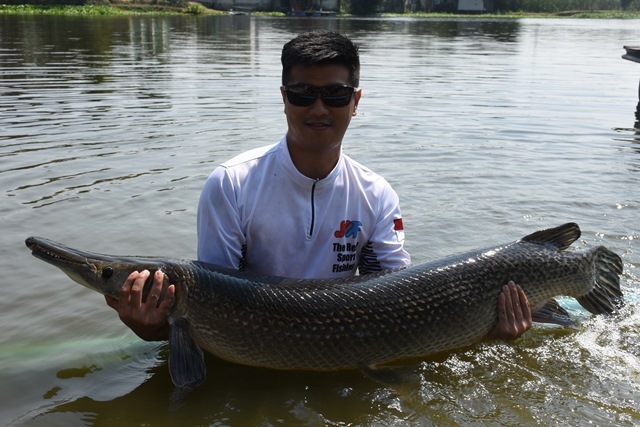 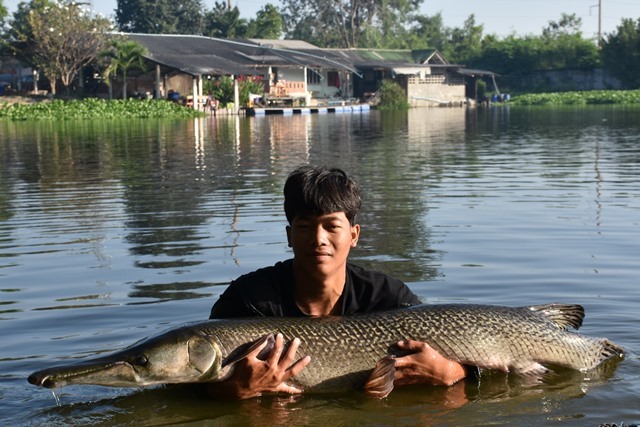 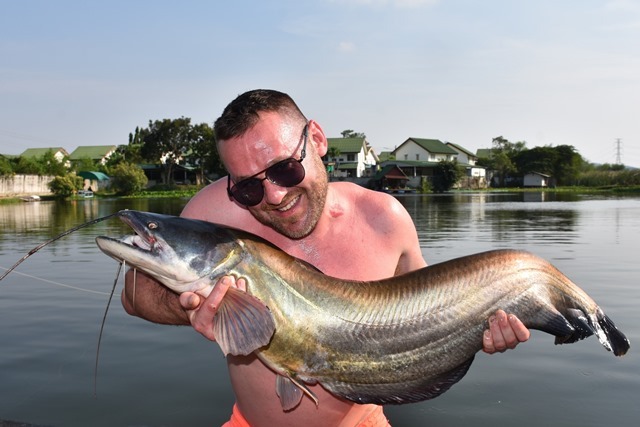 The guides has a fair go during the month catching a number of great catches that included some awesome Juliens golden price carp, Siamese carp, Mekong catfish, Salween rita, alligator gar, so mention a few as well as having a swim. 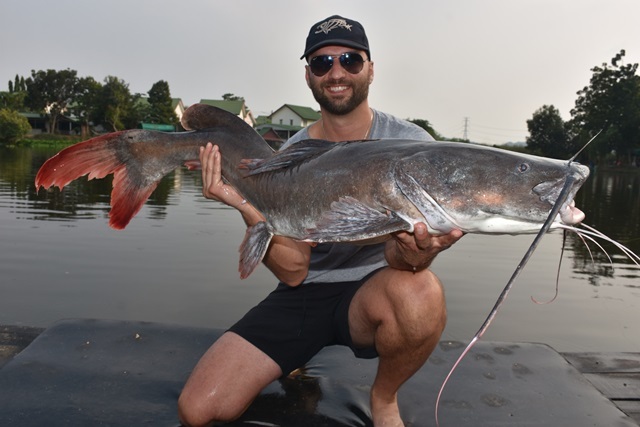 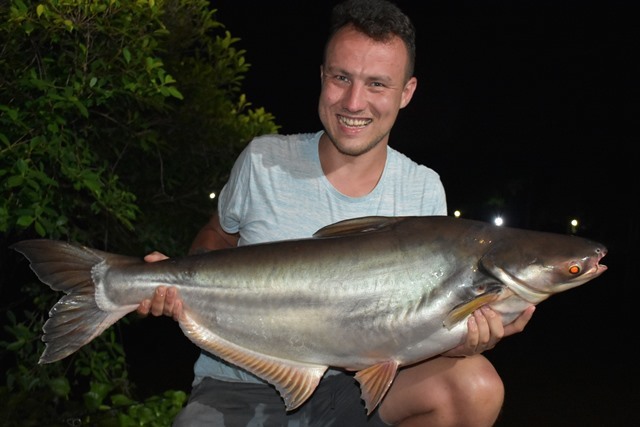 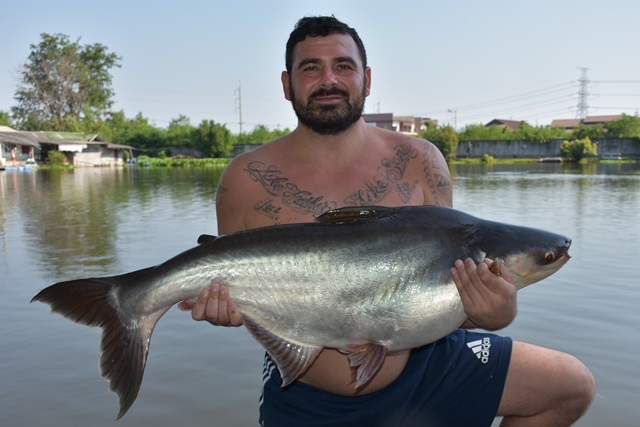 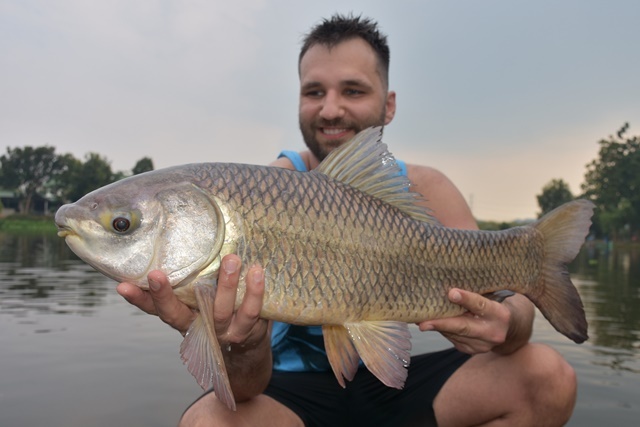 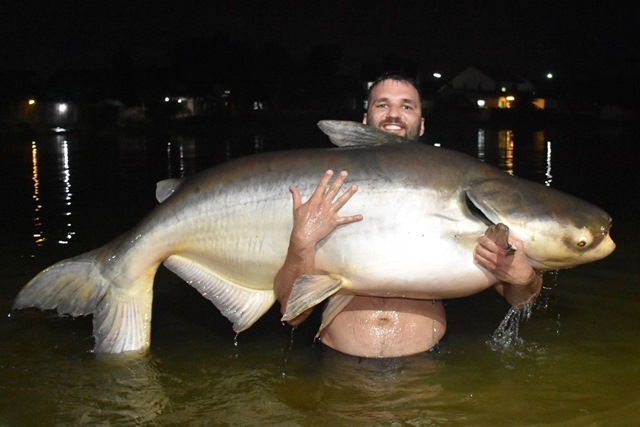 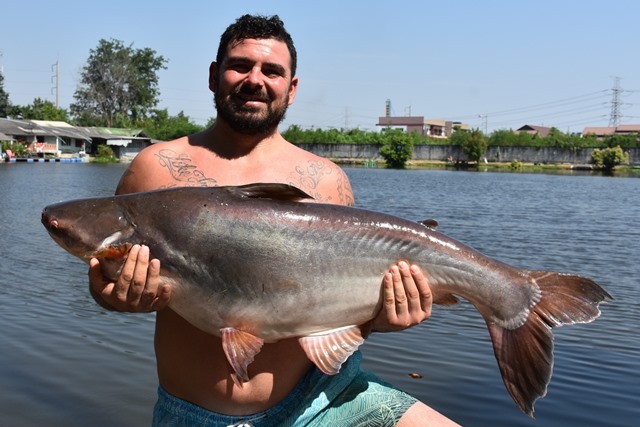 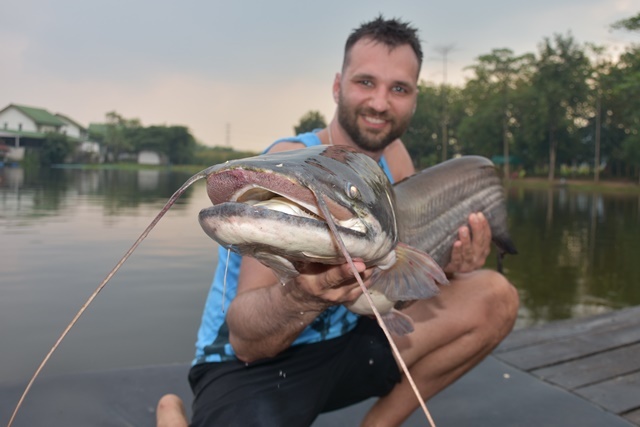 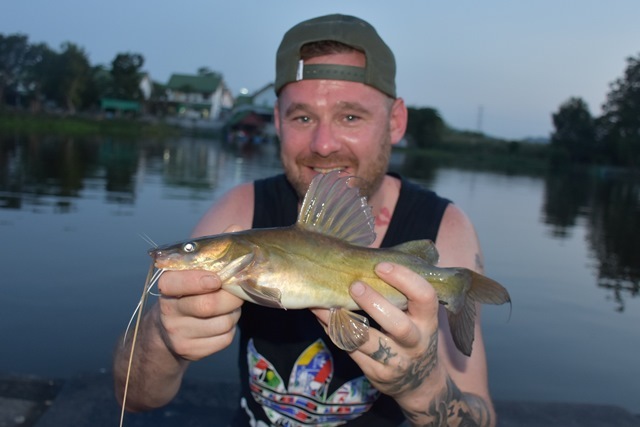 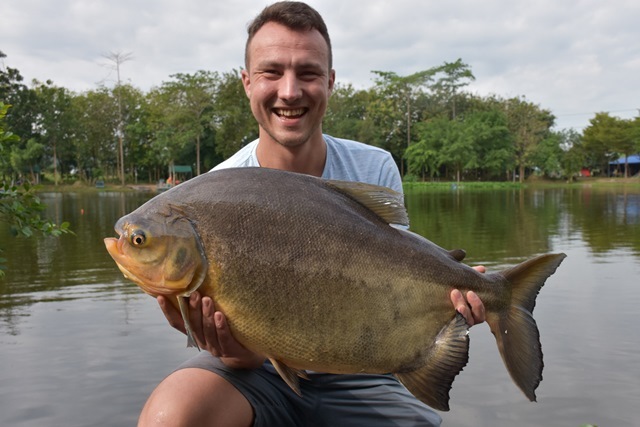 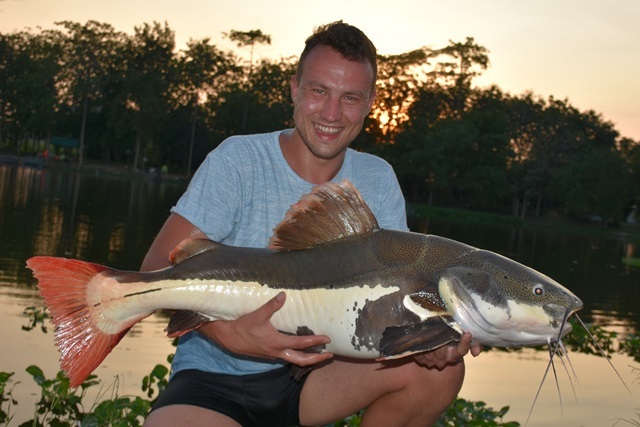 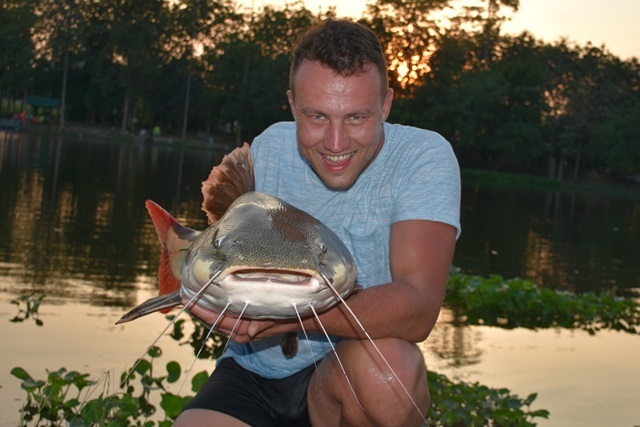 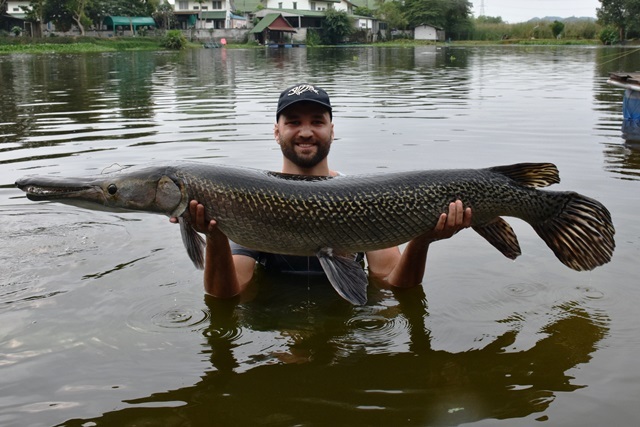 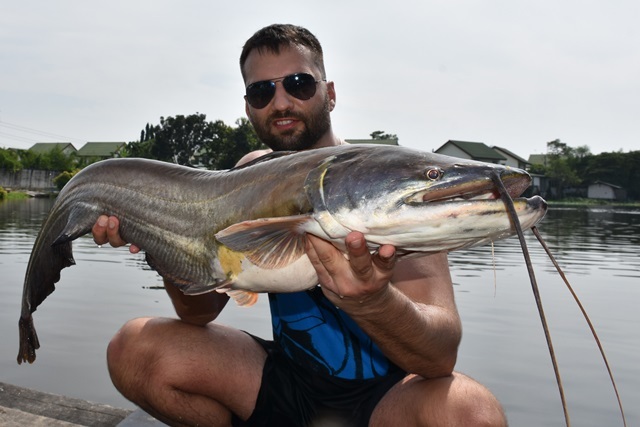 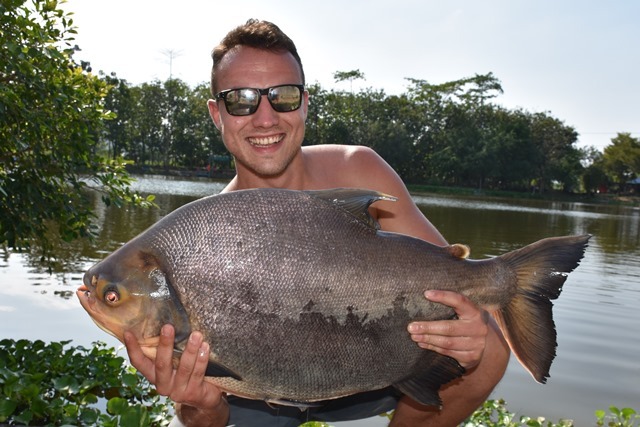 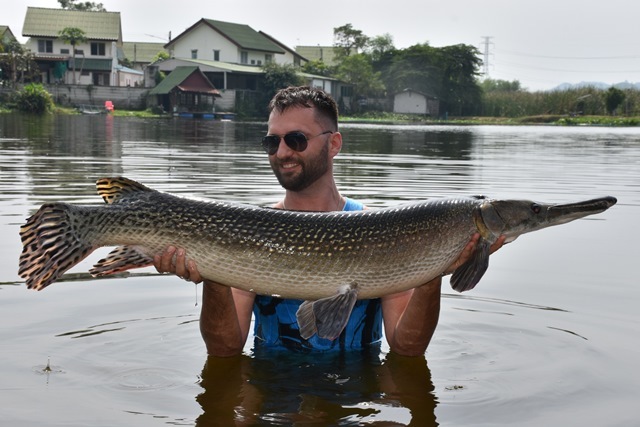 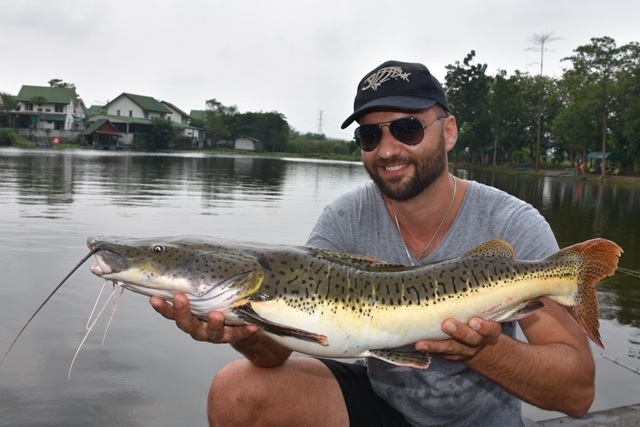 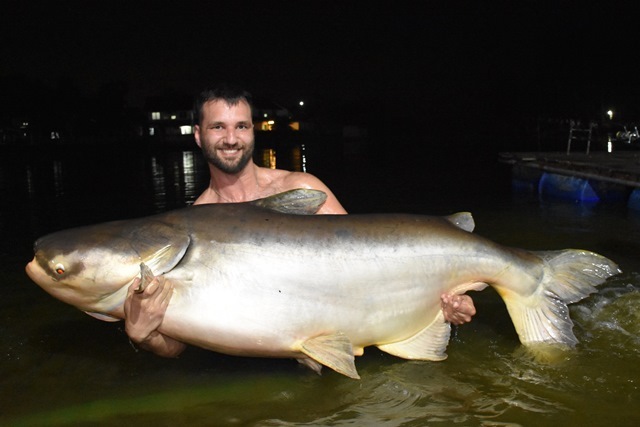 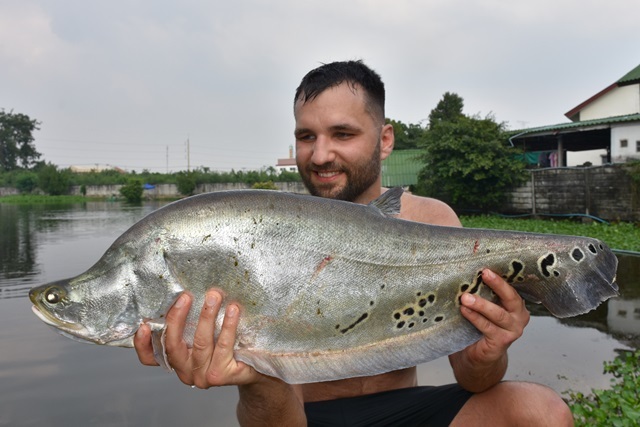 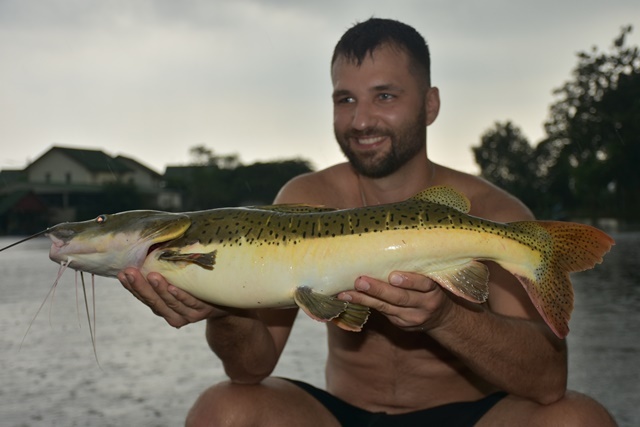 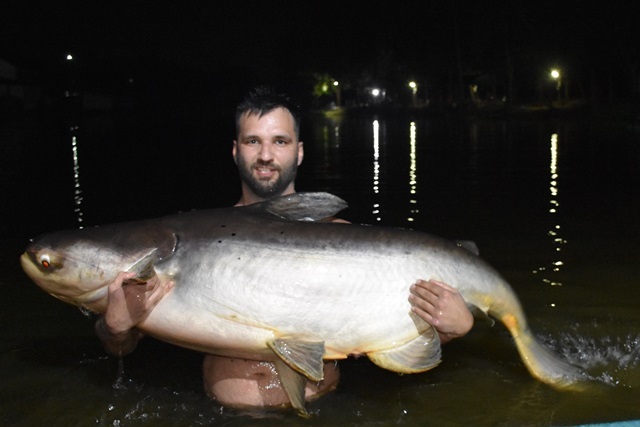 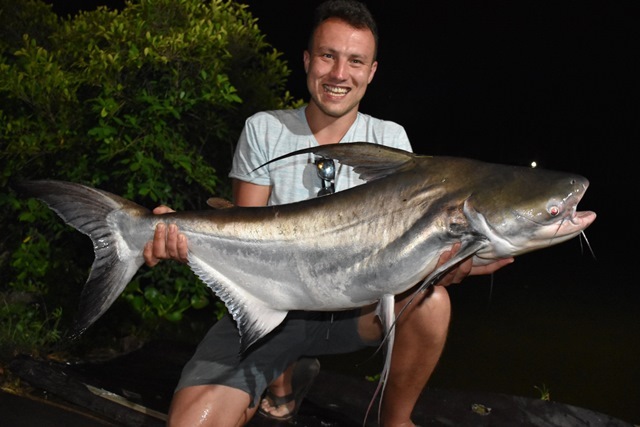 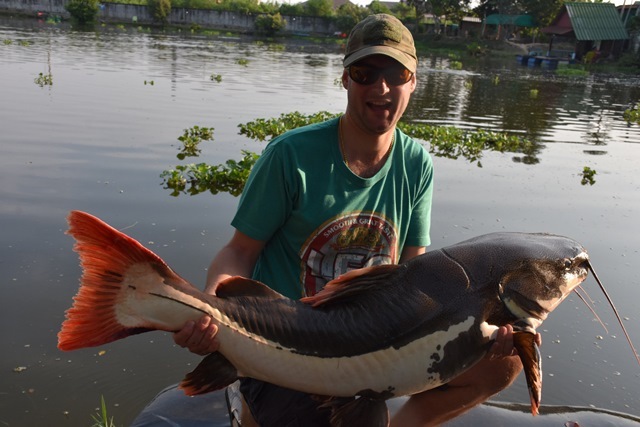 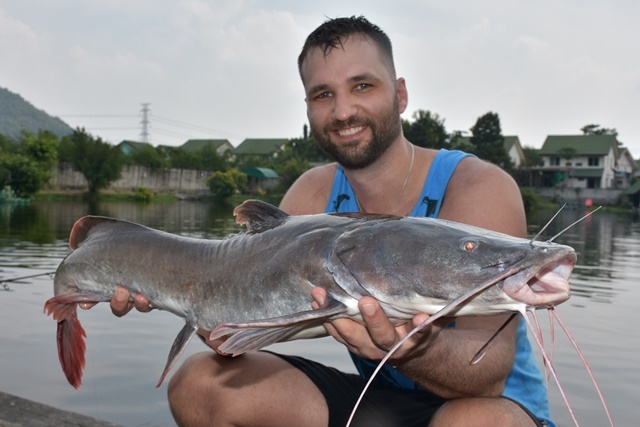 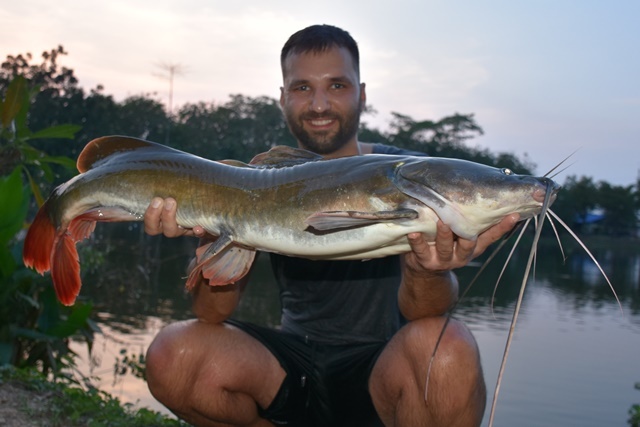 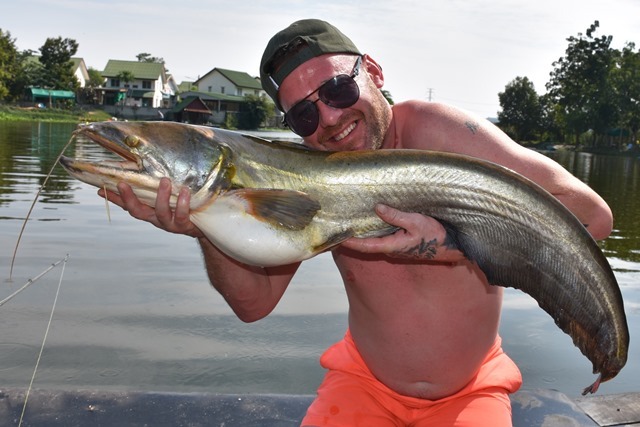 Polish angler Jakub Troszynski was all smiles during his brief visit to Palm Tree catching parapatinga, chao phraya catfish, pacu, striped catfish and Amazon redtail. 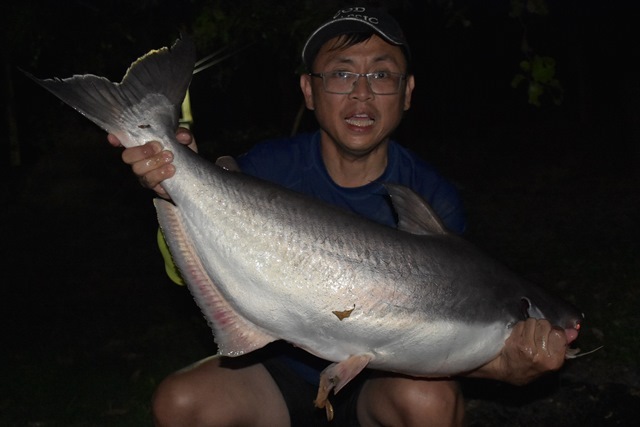 Glen Pile was another angler enjoying his first time experience at Palm Tree catching a number of nice catches like Siamese carp, wallago attu, alligator gar, striped catfish, as well as both Asian and Amazon redtail. 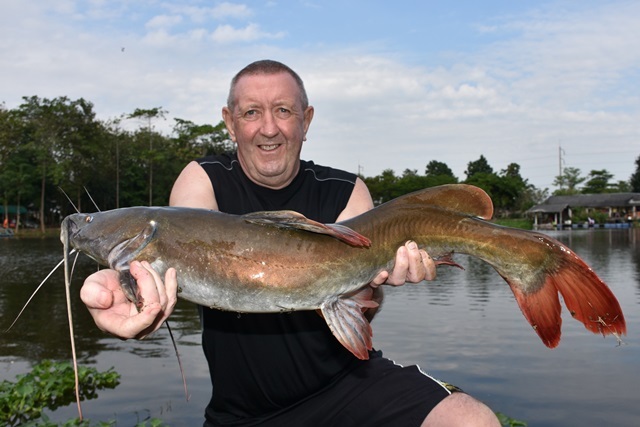 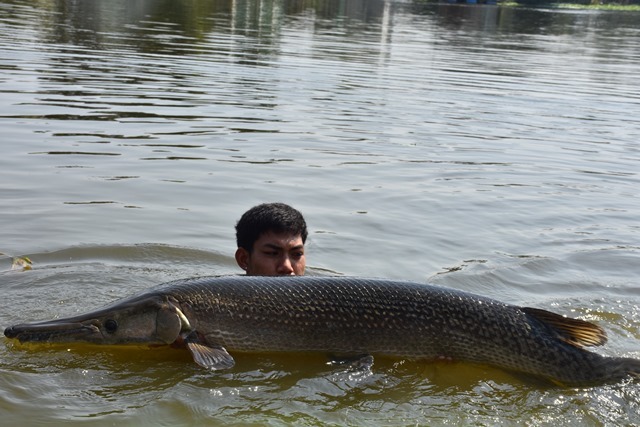 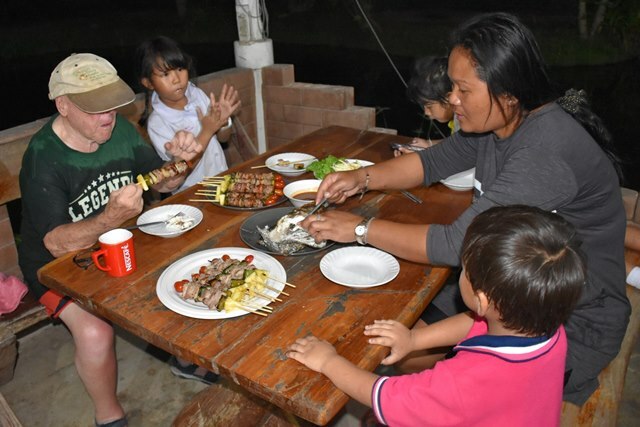 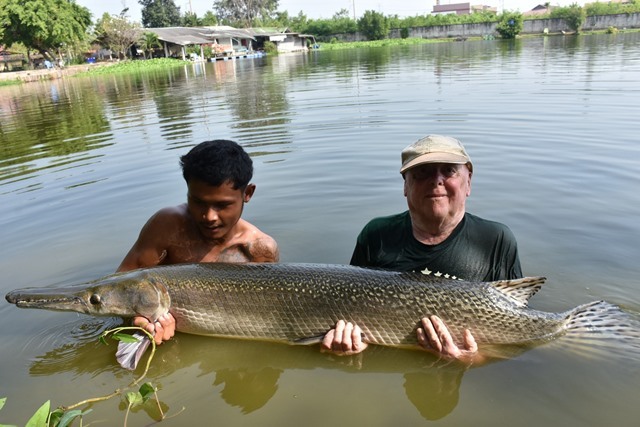 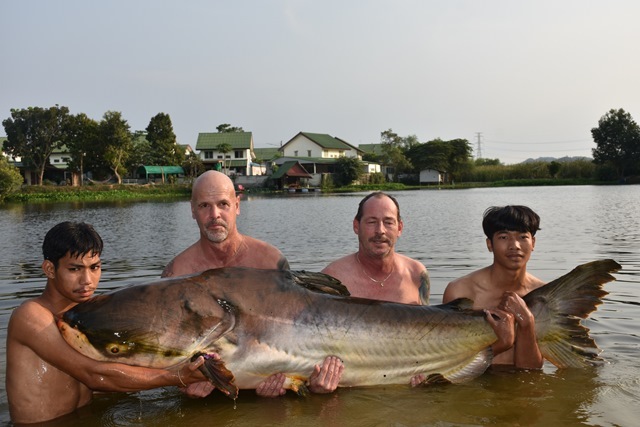 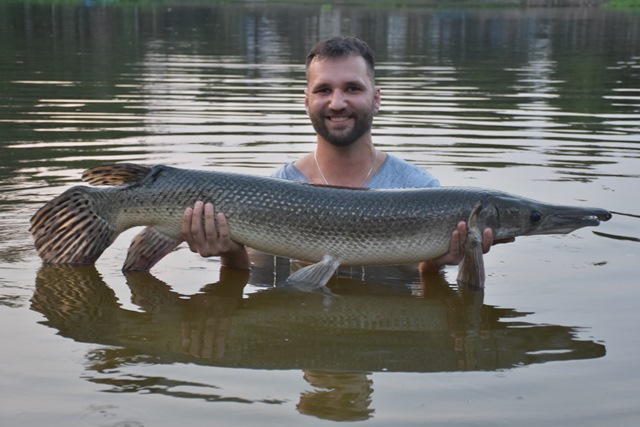 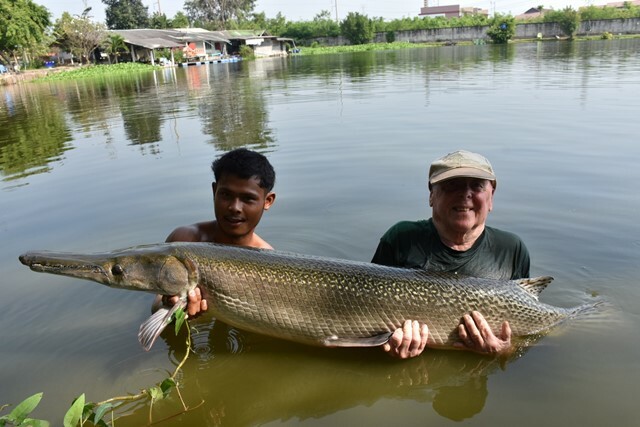 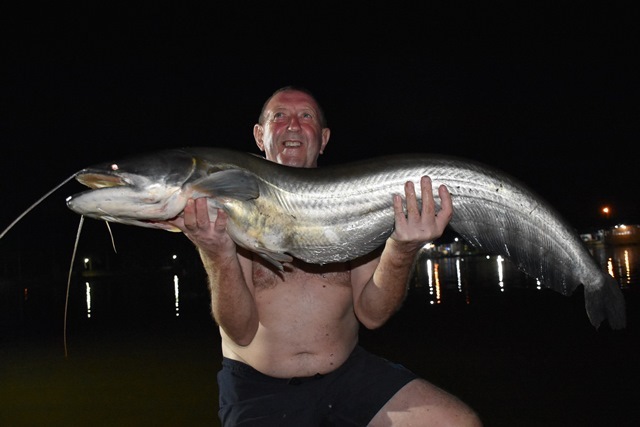 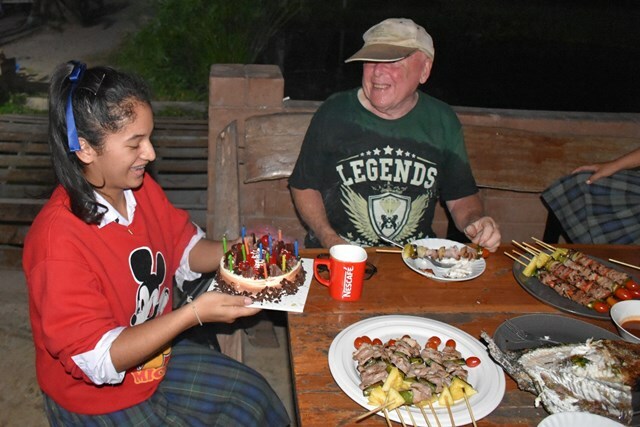 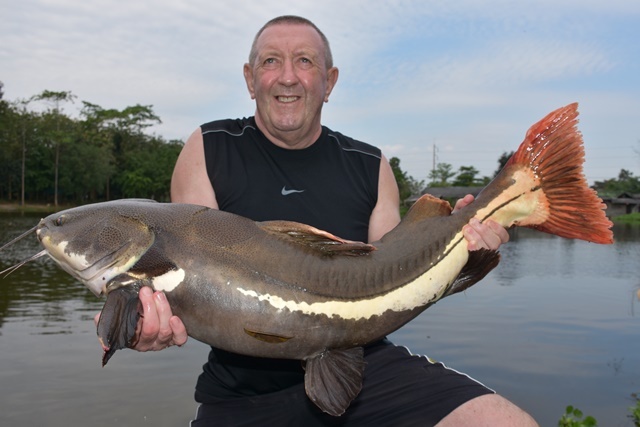 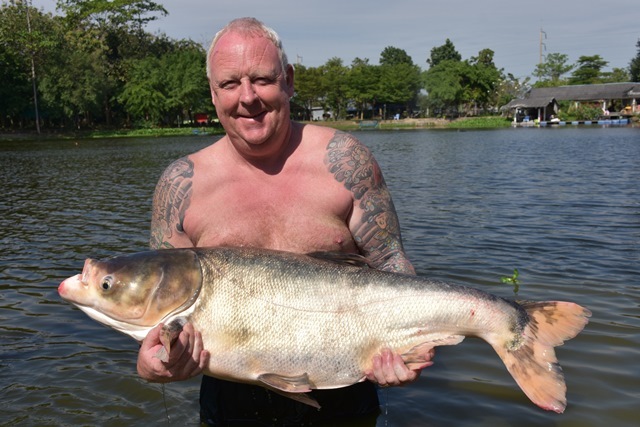 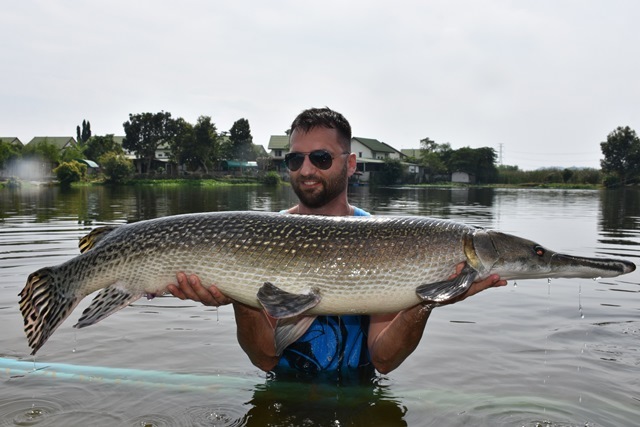 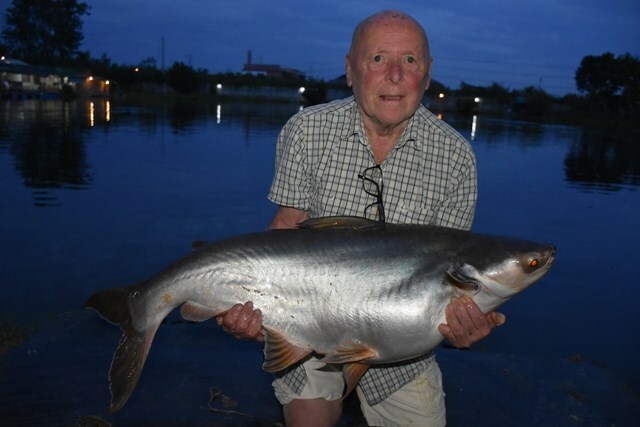 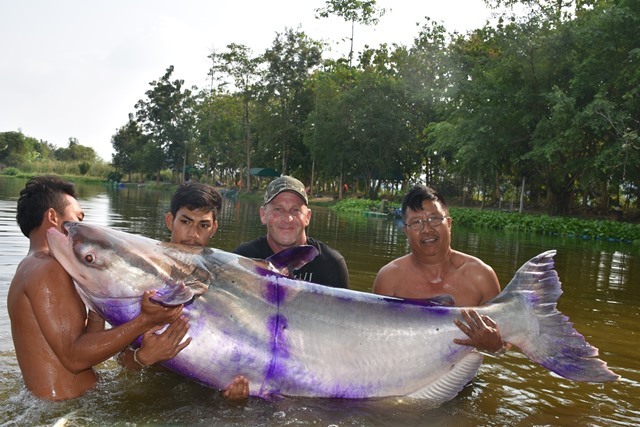 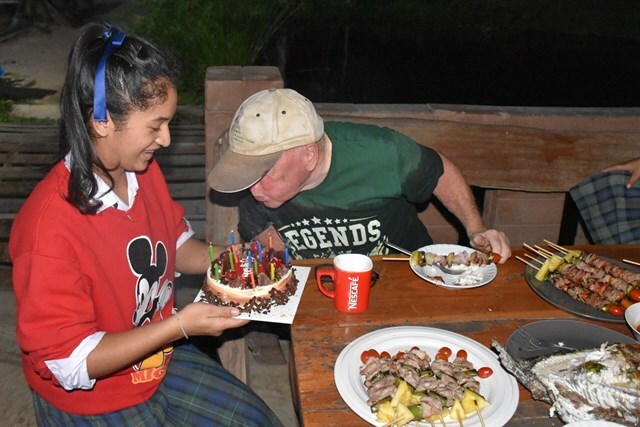 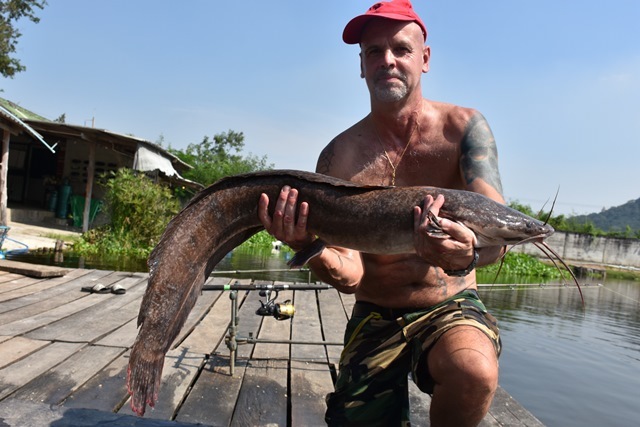 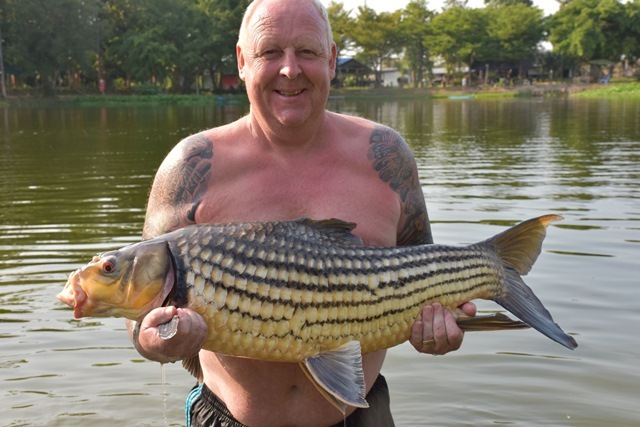 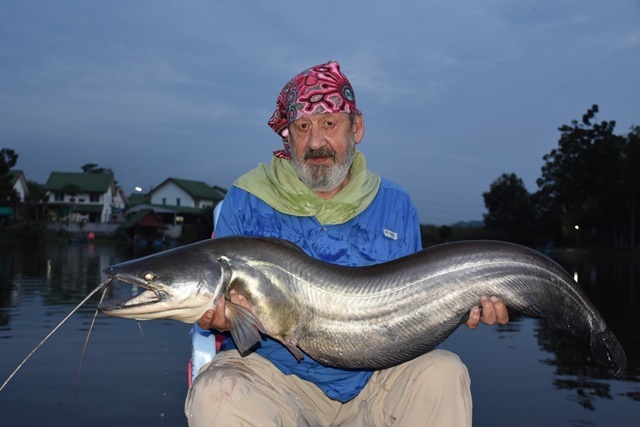 Ray Allsop who has fished many venues in Thailand made his début during the month catching a variety of great catches that included a pb alligator gar, black shark minnow a new species for him as well as tambaqui, striped catfish, Mekong catfish, Siamese carp, rohu, and both Amazon and Asian redtail. 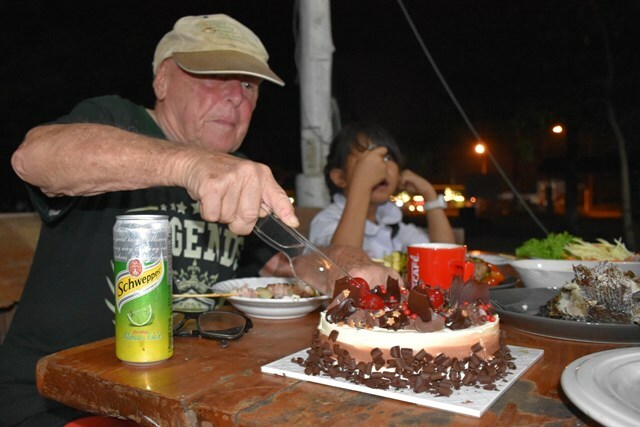 Not bad for a man who also celebrated hs 86th birthday during the visit. 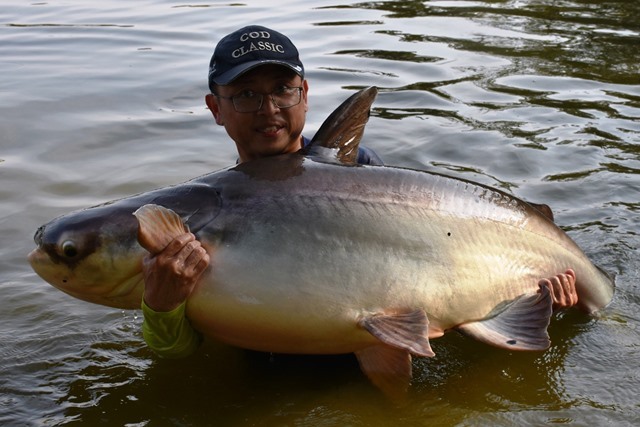 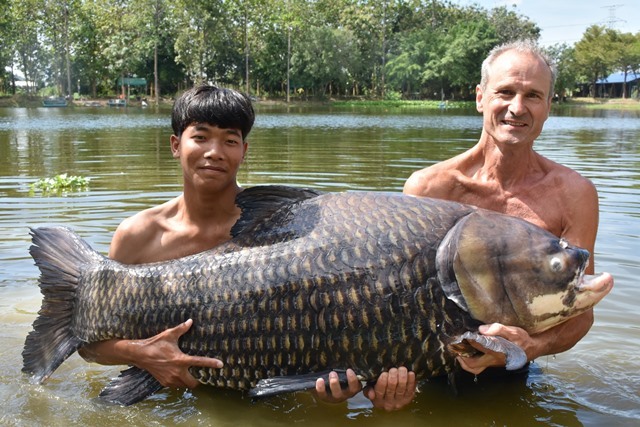 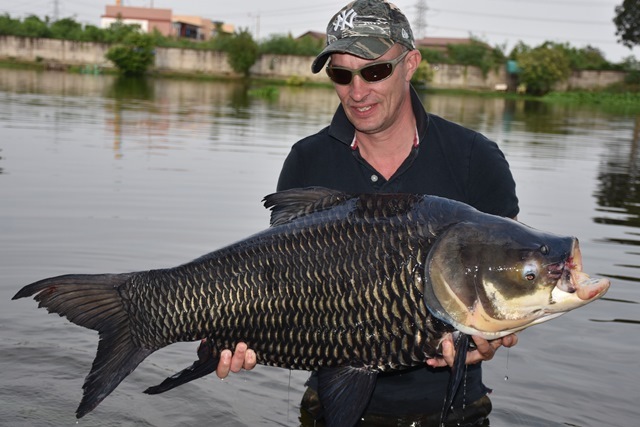 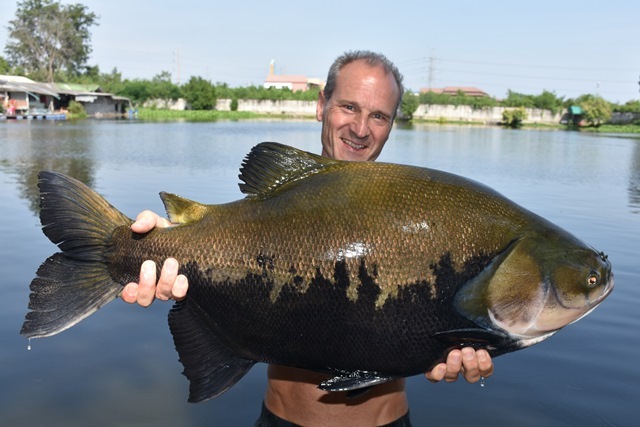 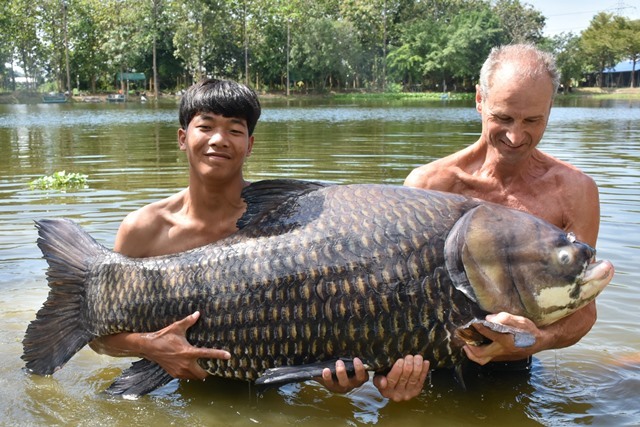 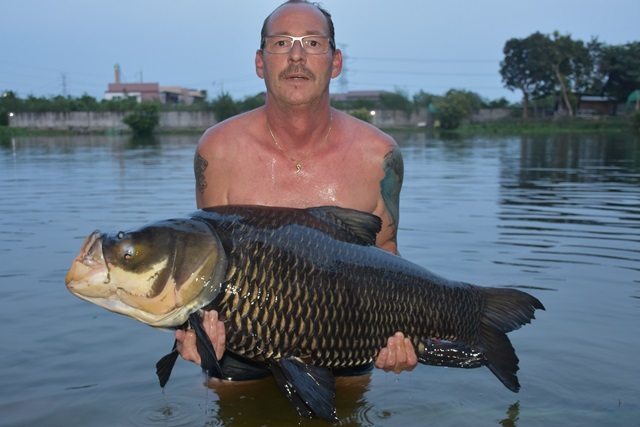 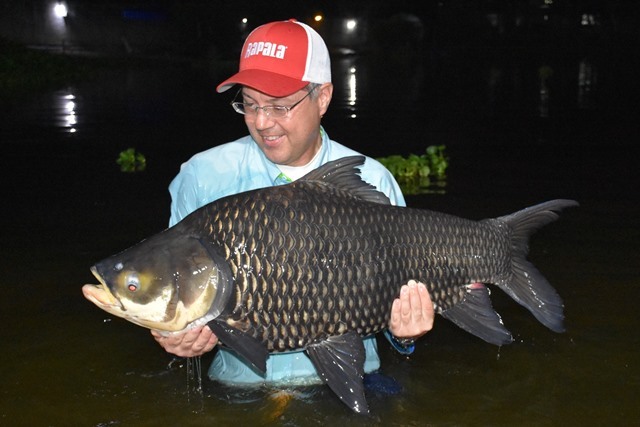 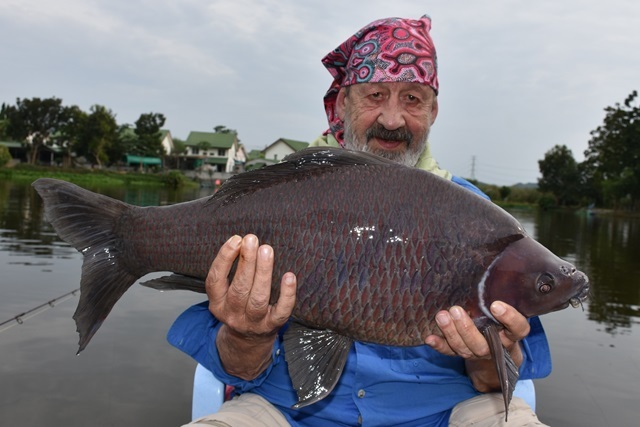 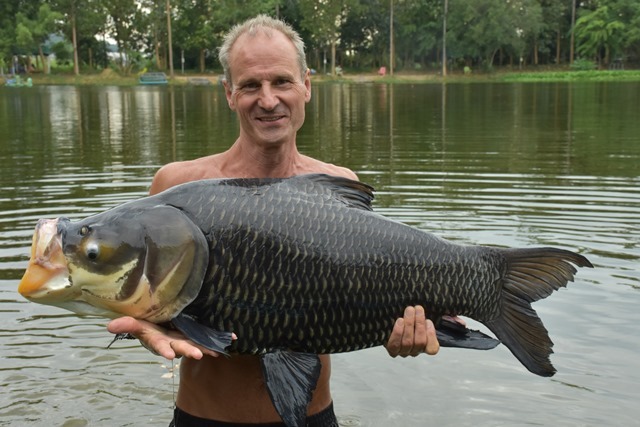 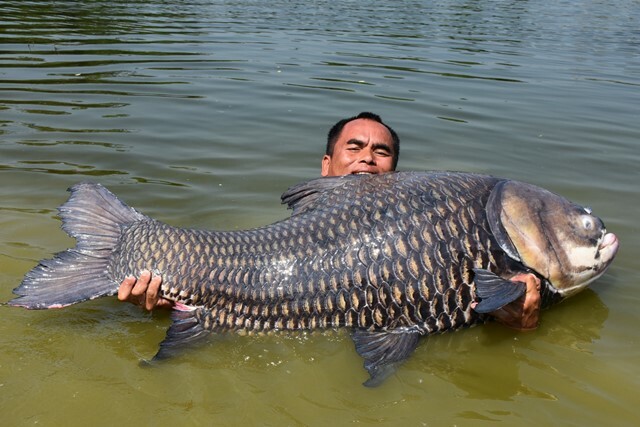 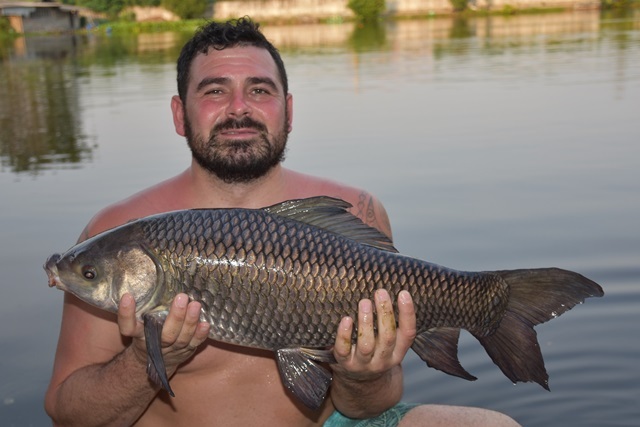 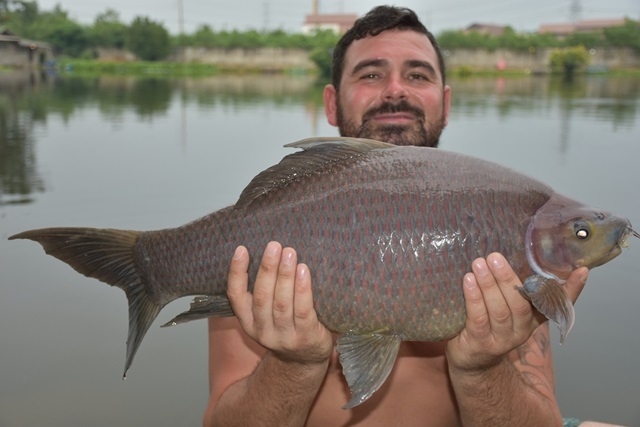 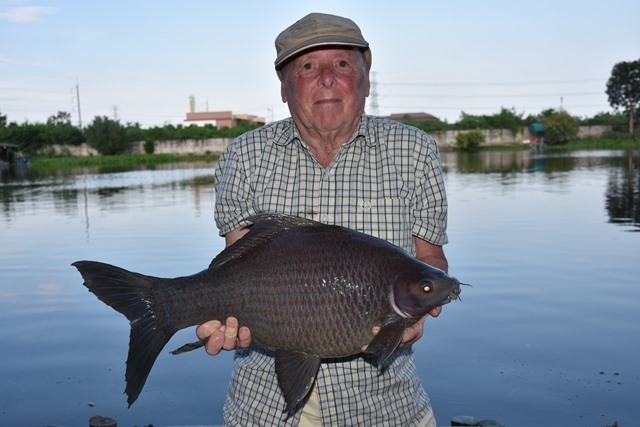 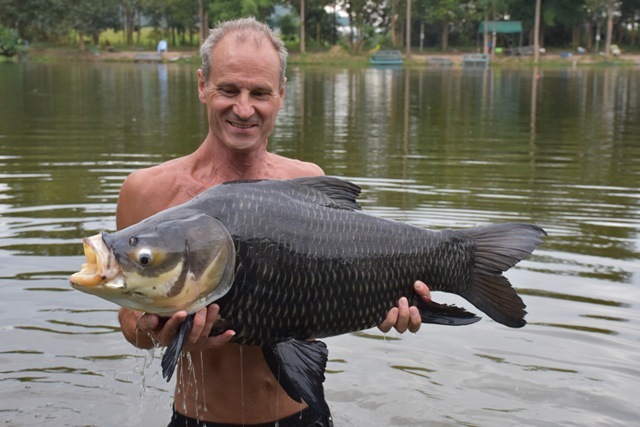 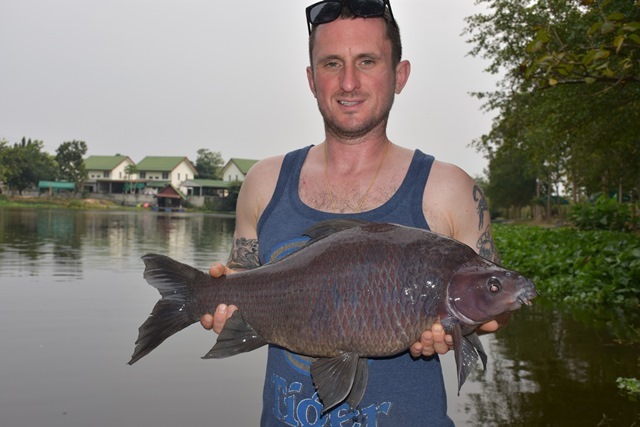 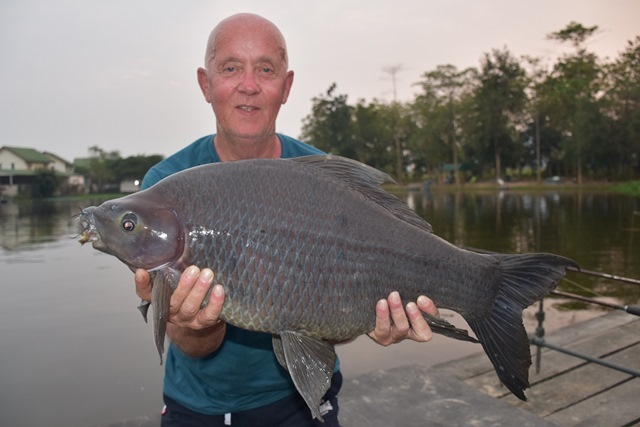 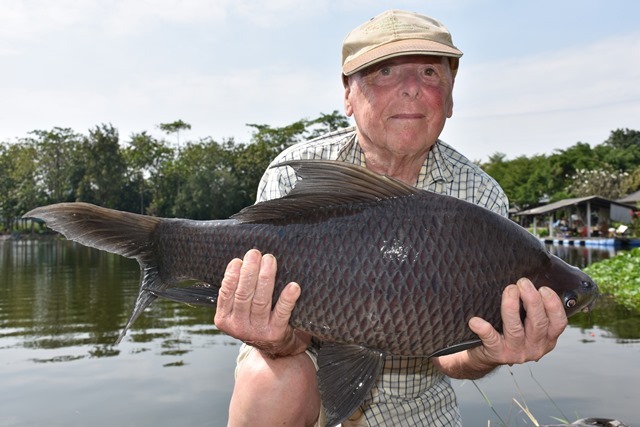 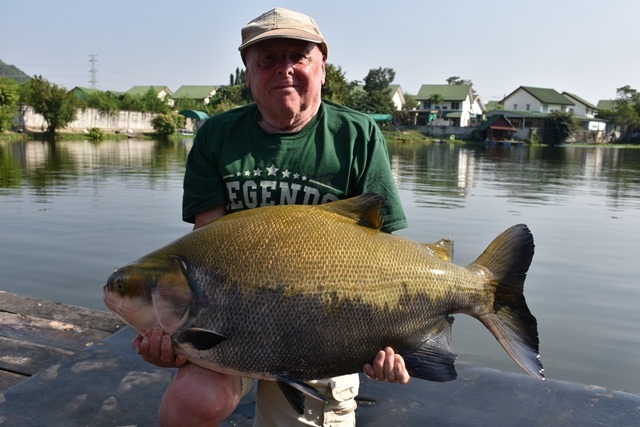 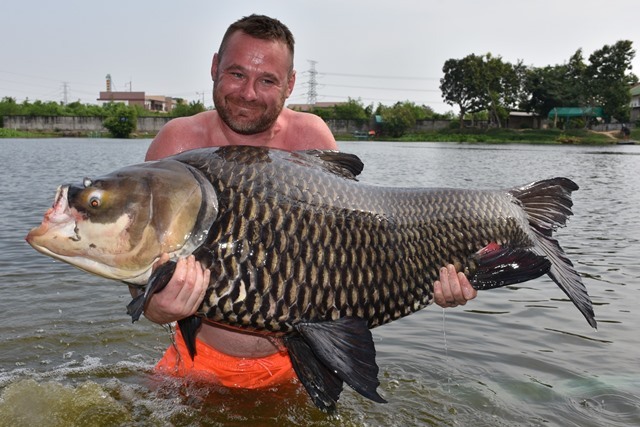 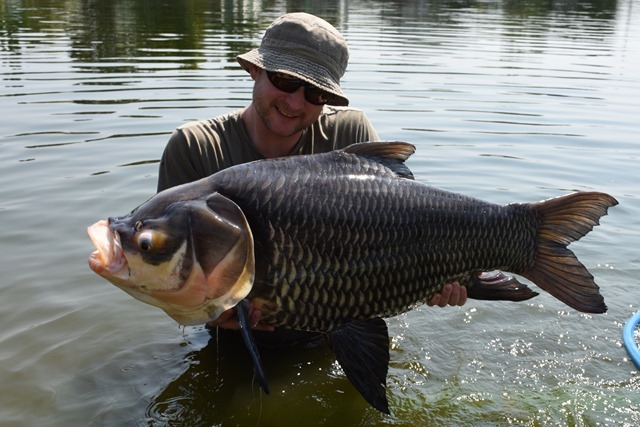 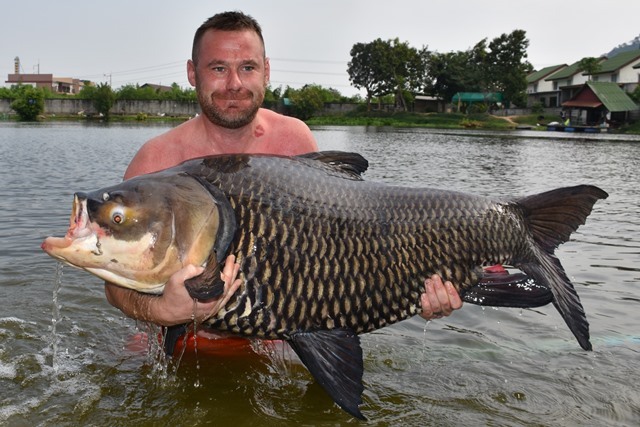 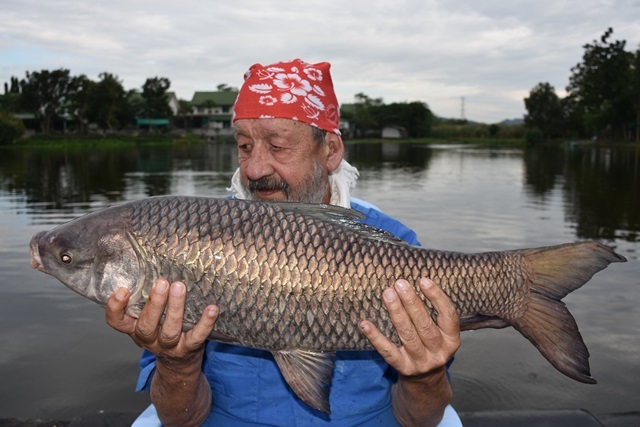 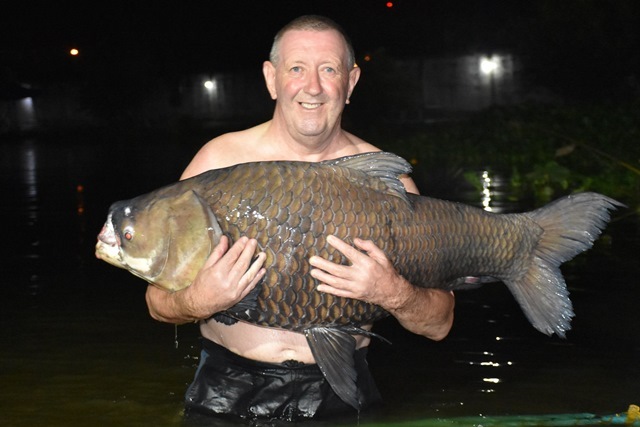 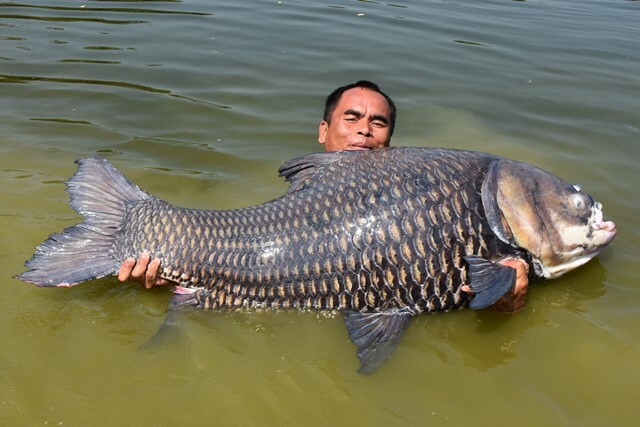 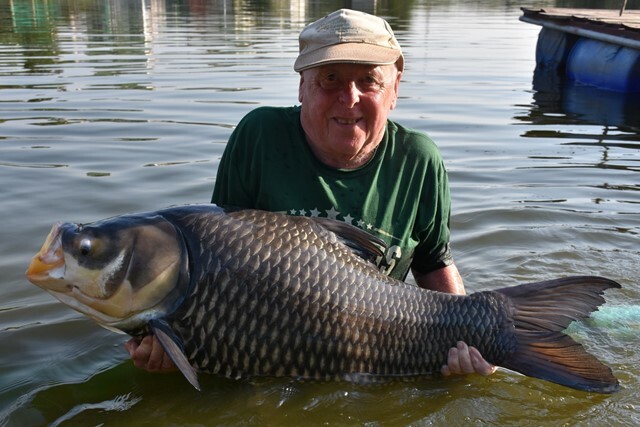 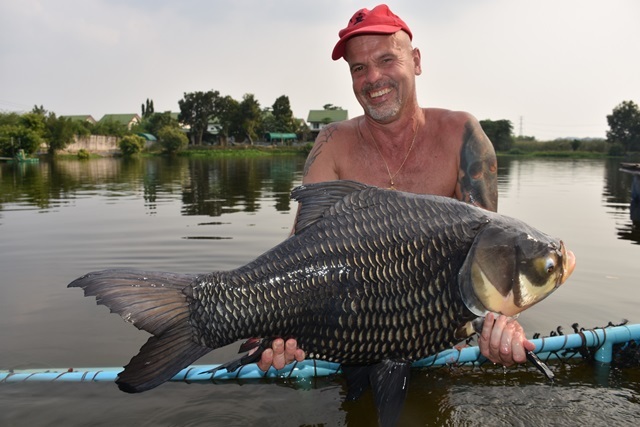 Michael Felton was back for a quick visit with a fishing mate catching a rare and very plump Chinese black carp, as well as Amazon redtail and Mekong catfish. 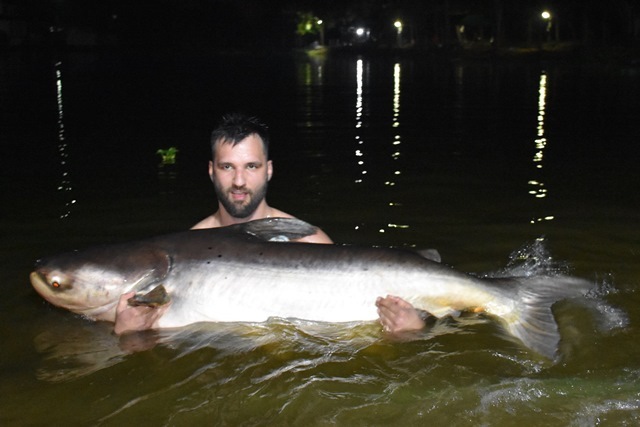 Lewes Hurley and Will Hancock thought they would try Palm Tree as a change of venue and said they would be returning soon after catching a pb alligator gar, as well as Siamese carp, striped catfish and both Amazon and Asian redtail. 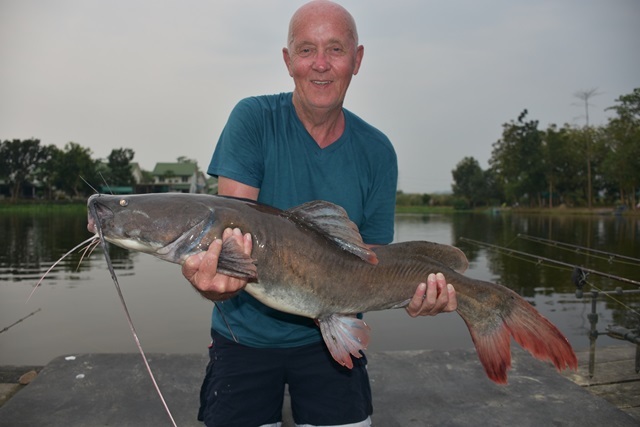 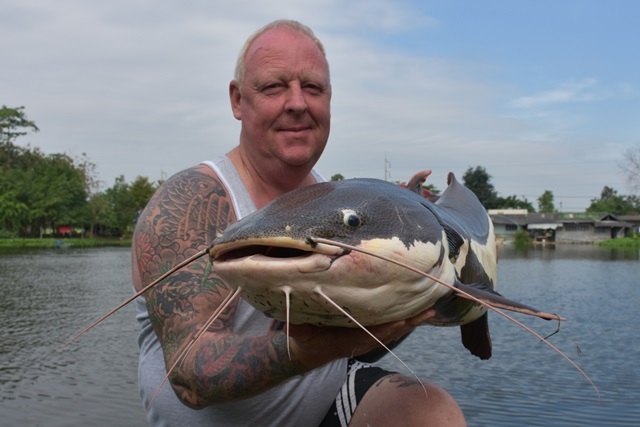 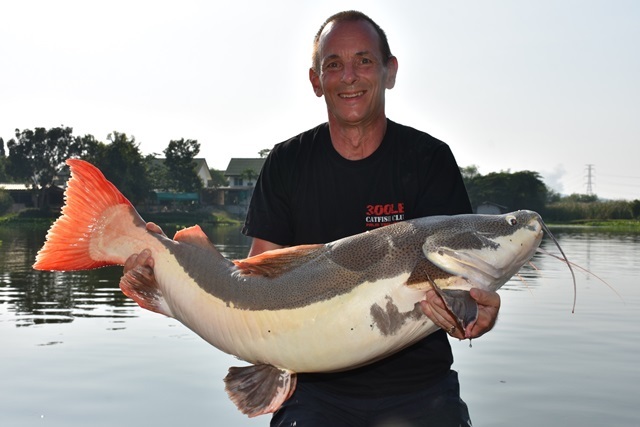 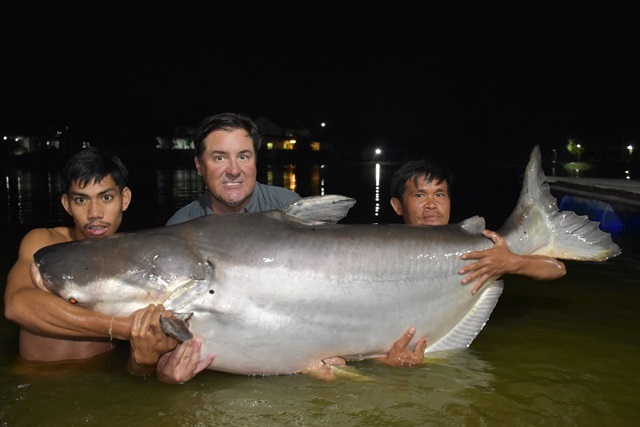 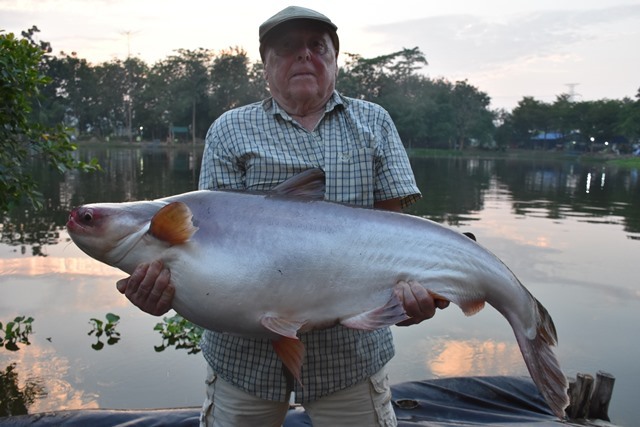 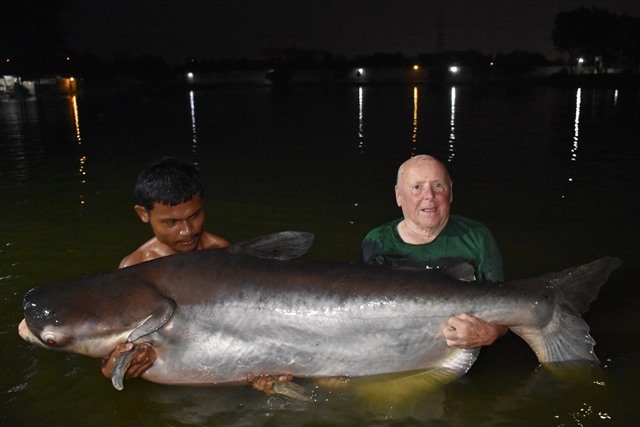 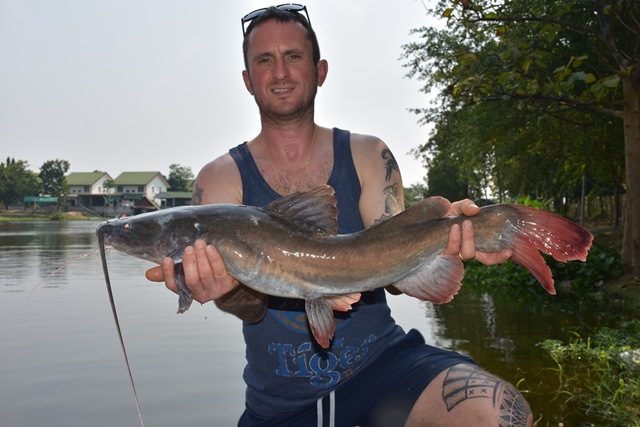 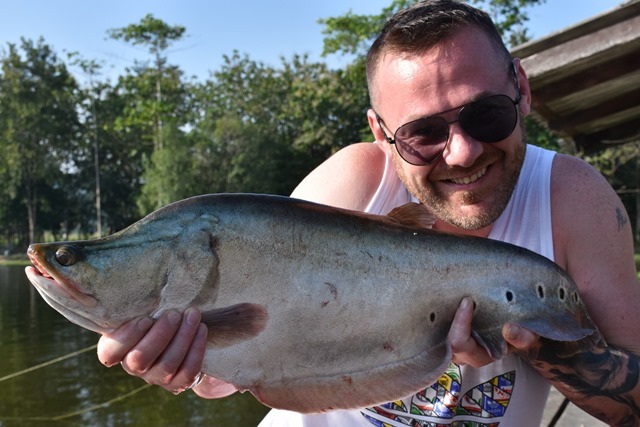 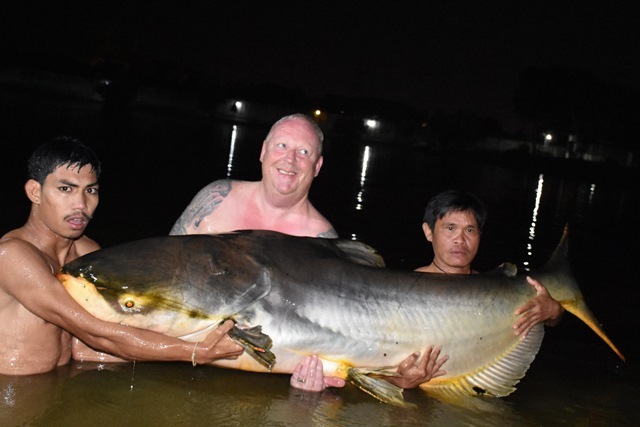 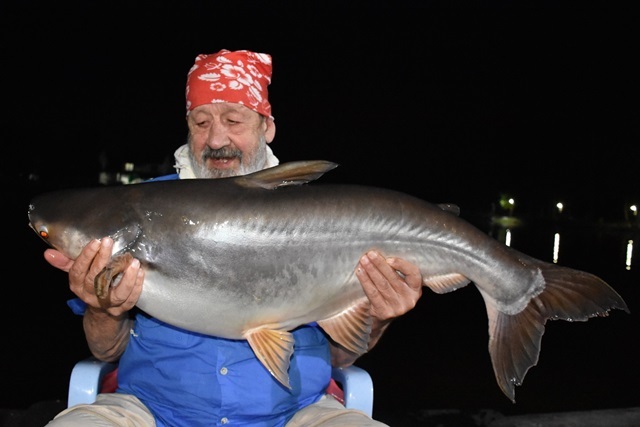 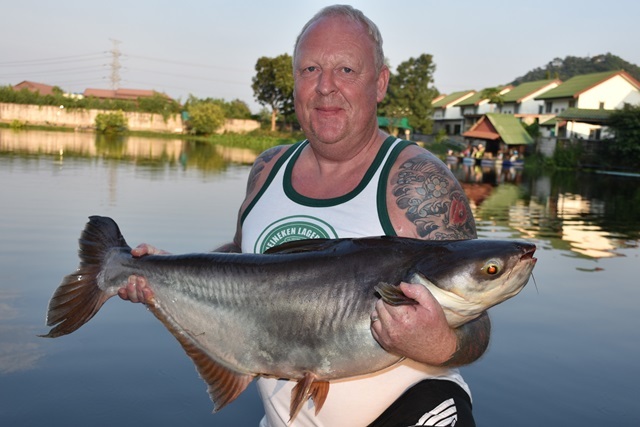 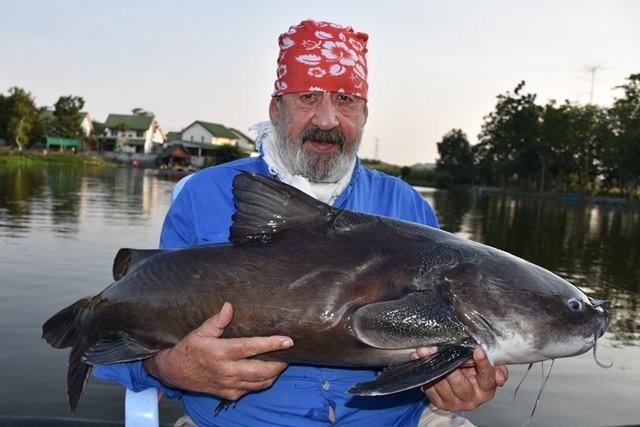 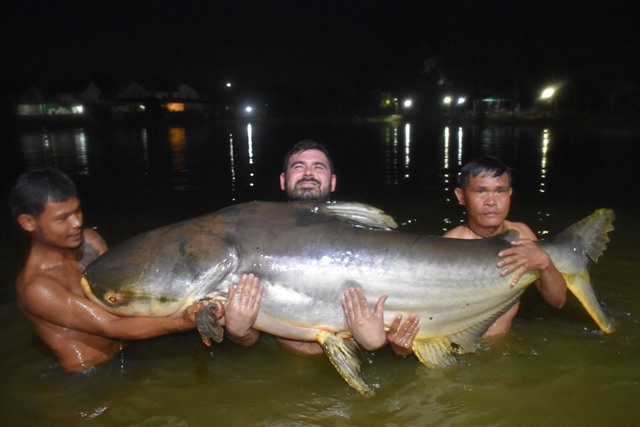 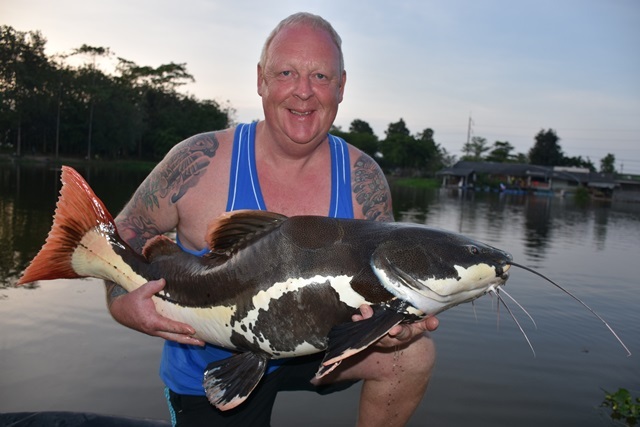 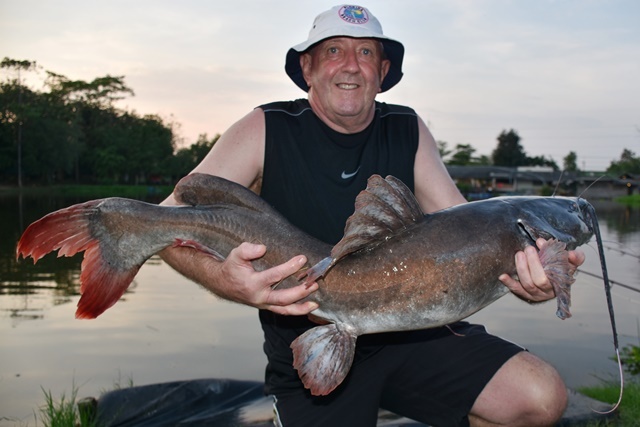 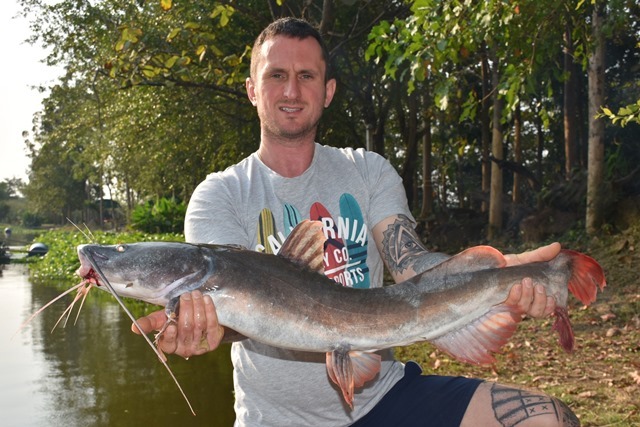 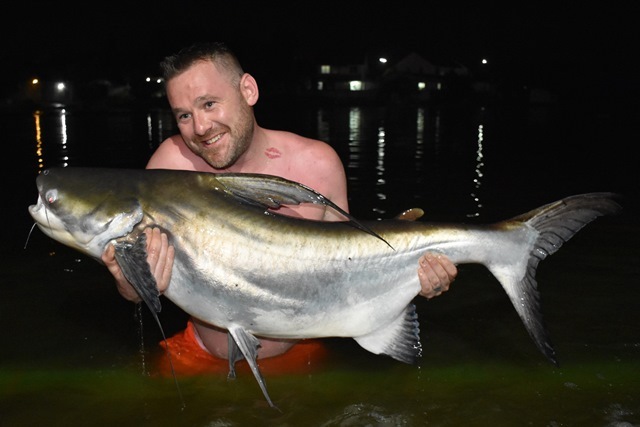 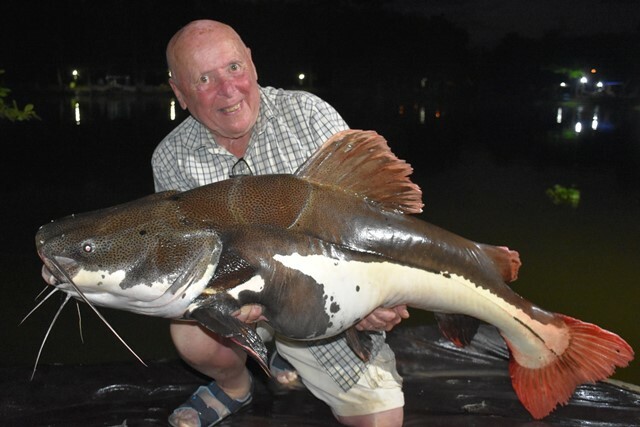 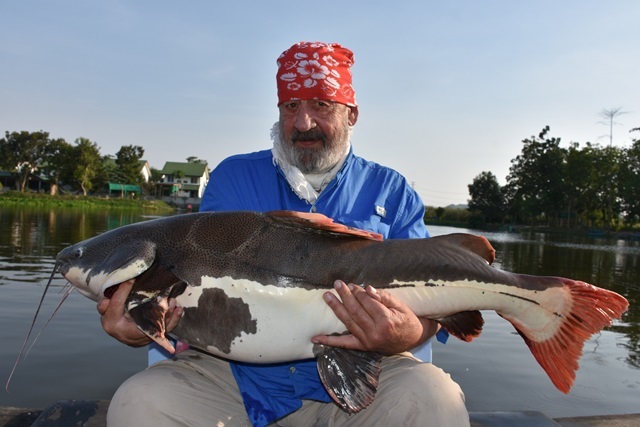 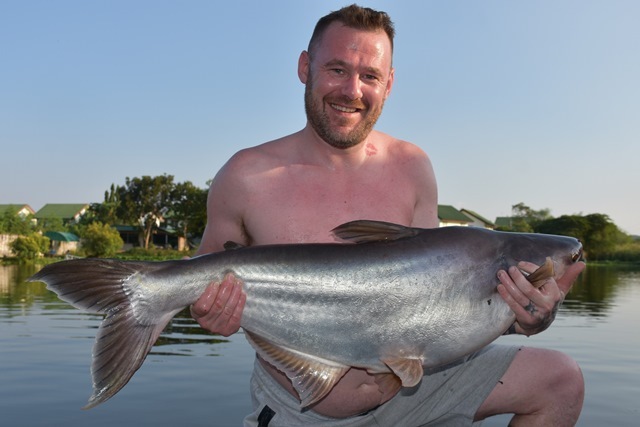 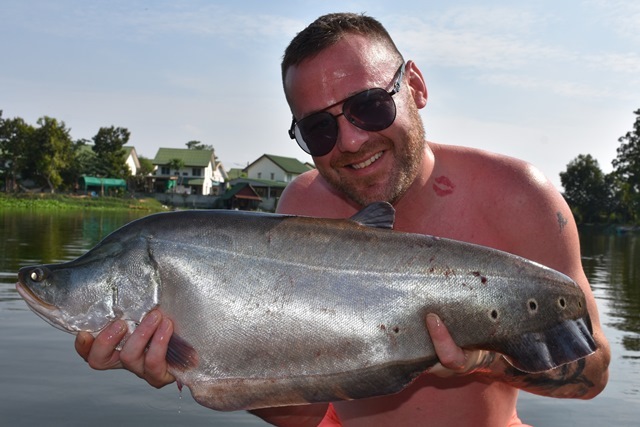 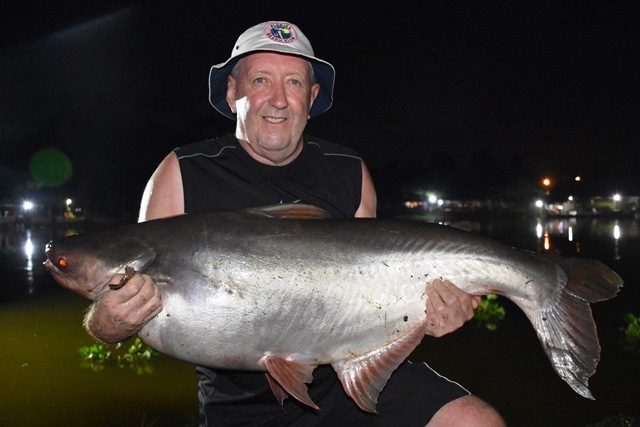 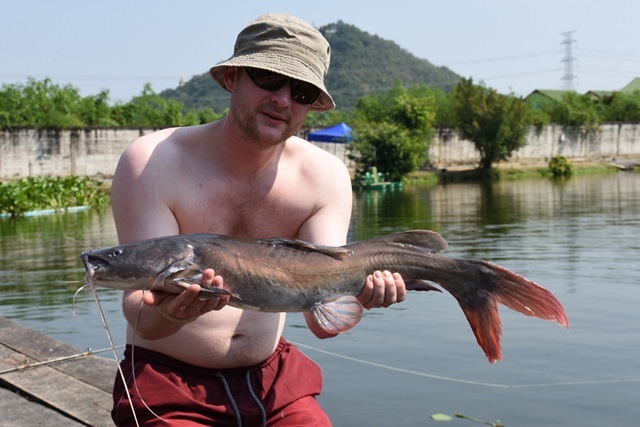 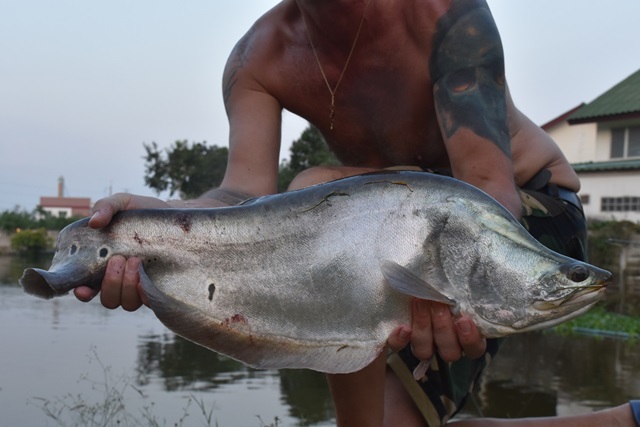 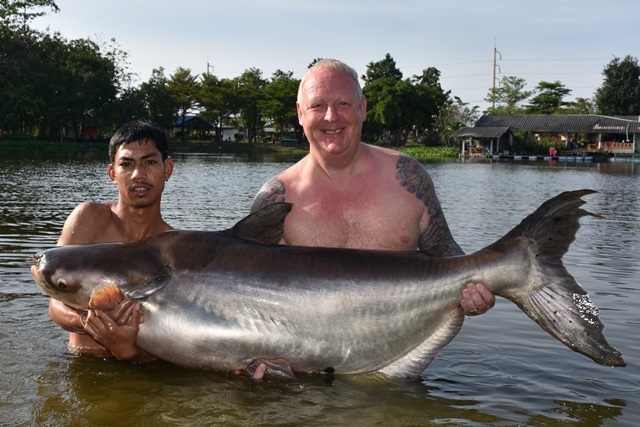 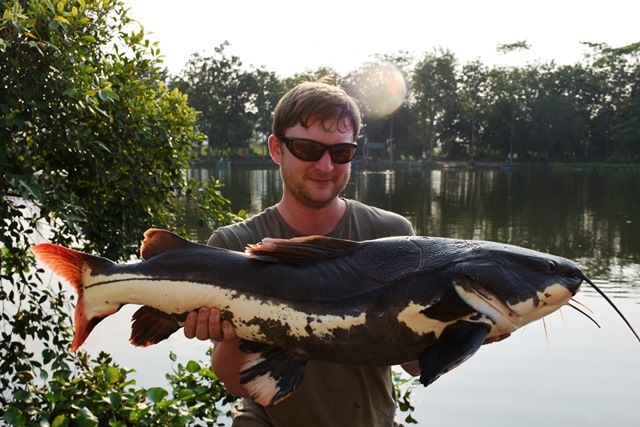 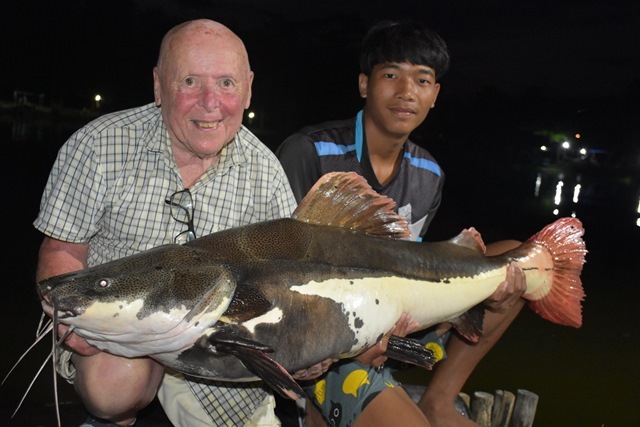 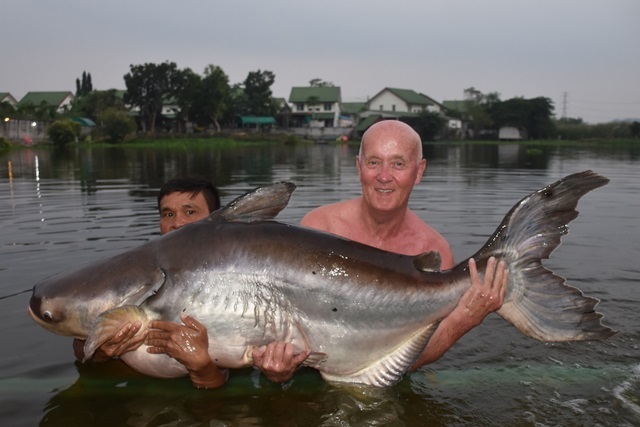 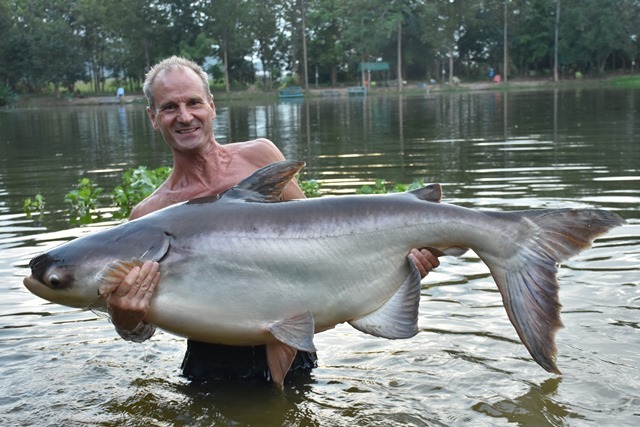 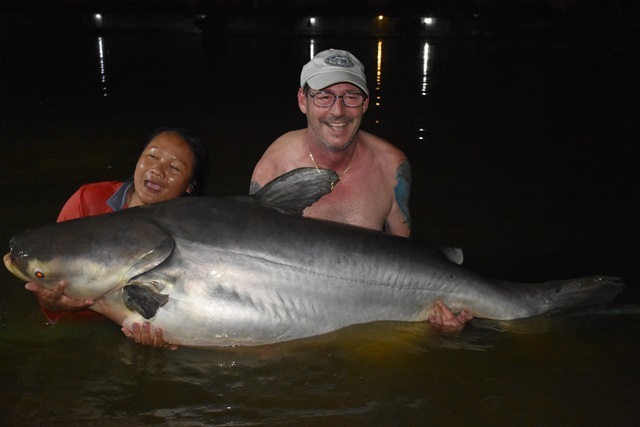 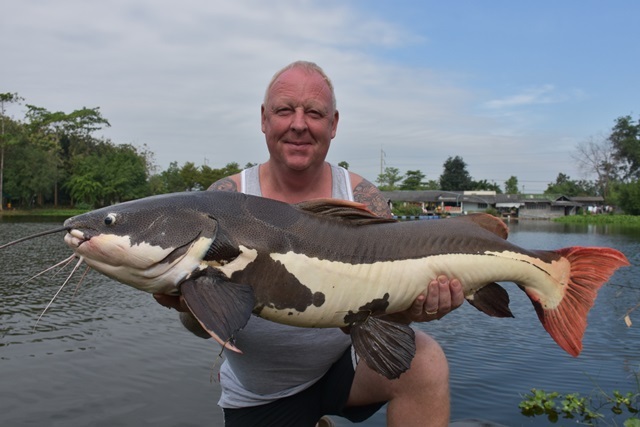 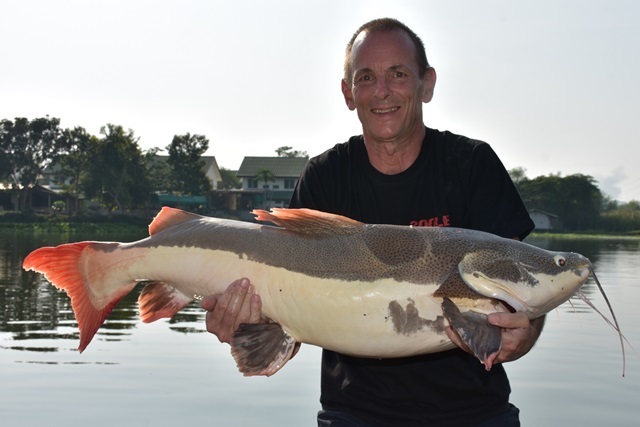 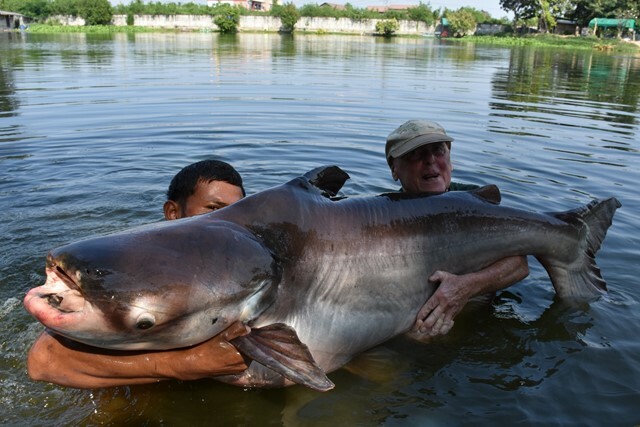 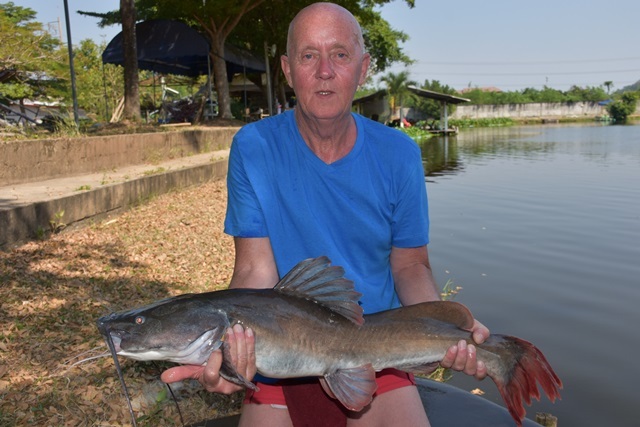 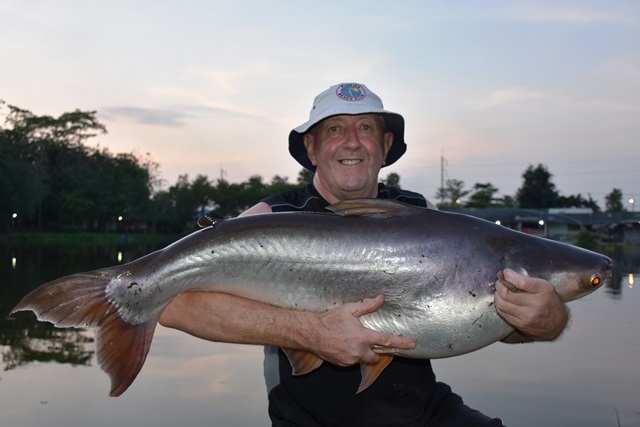 Clive Hayes was another first time angler who joined the Palm Tree BIG Catfish Club also landing the 'Friendly Mekong' after a lengthy two hour battle. 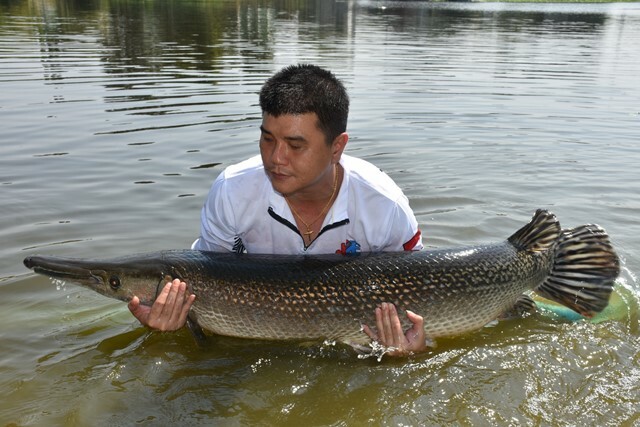 He also caught black shark minnow, striped catfish and Asian redtail. 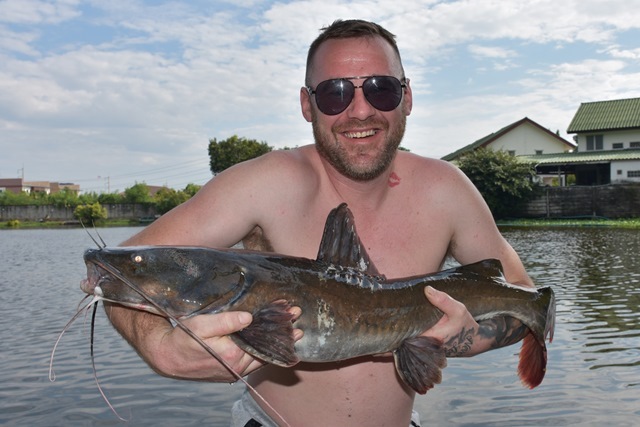 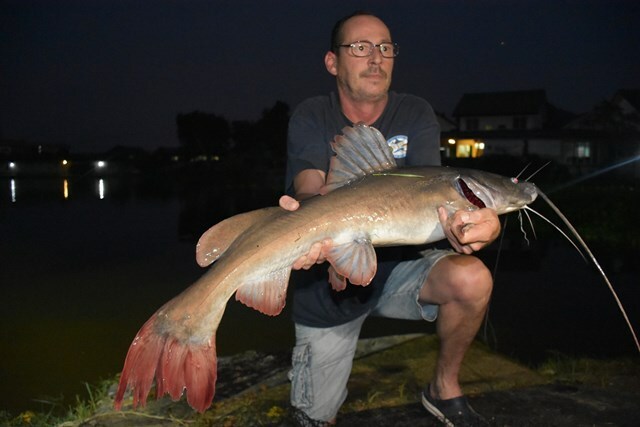 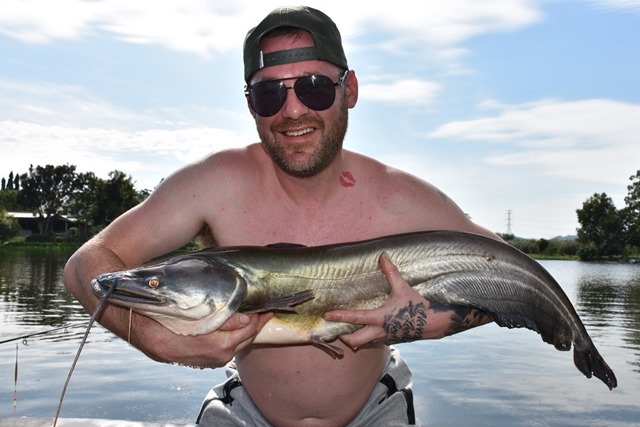 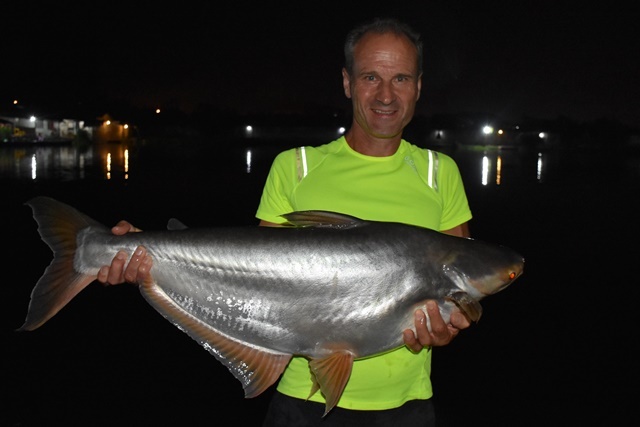 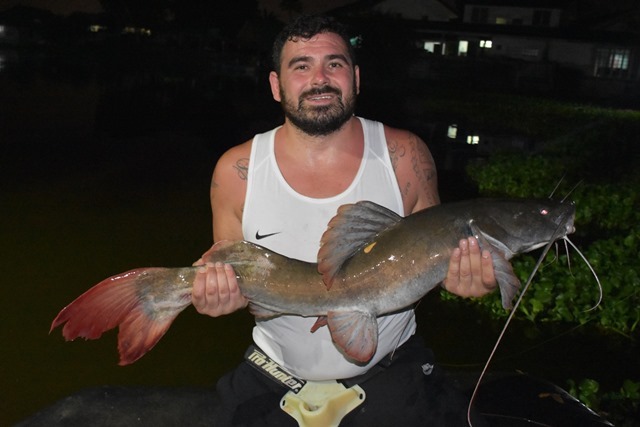 Mikey Nicholettos enjoyed his first session at Palm Tree and vowed to be back after joining the Palm Tree BIG Catfish Club by catching the friendly Mekong as well black shark minnow, striped catfish, rohu, and Asian redtail. 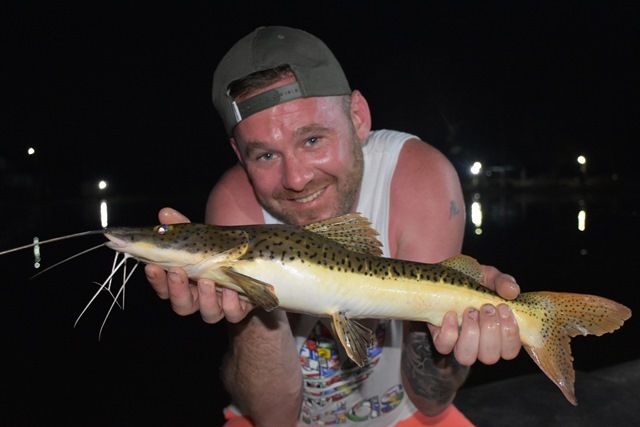 Palm Tree regular Gavin Hope returned and although it was a slow session by his standards he still managed a pb alligator gar as well as black shark minnow, striped catfish and Asian redtail. 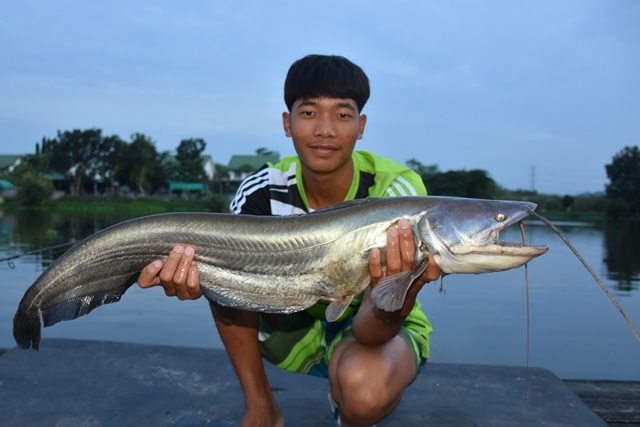 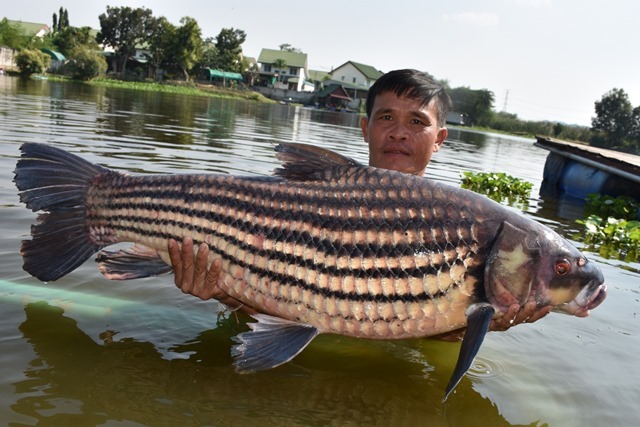 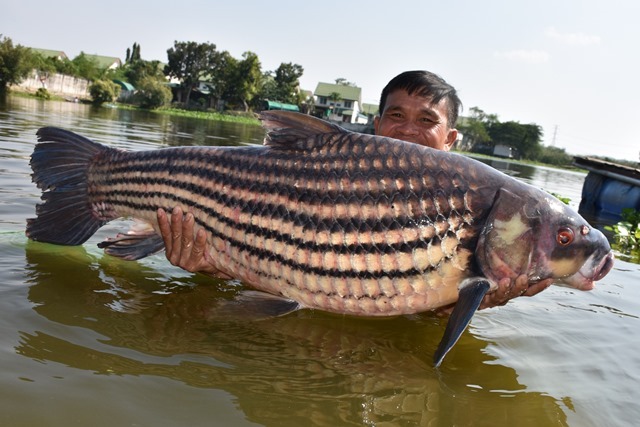 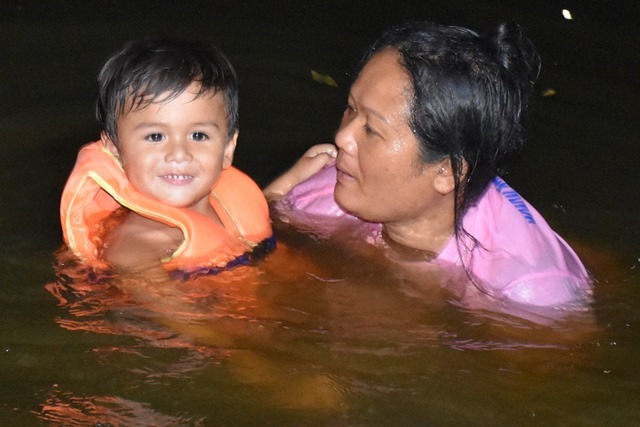 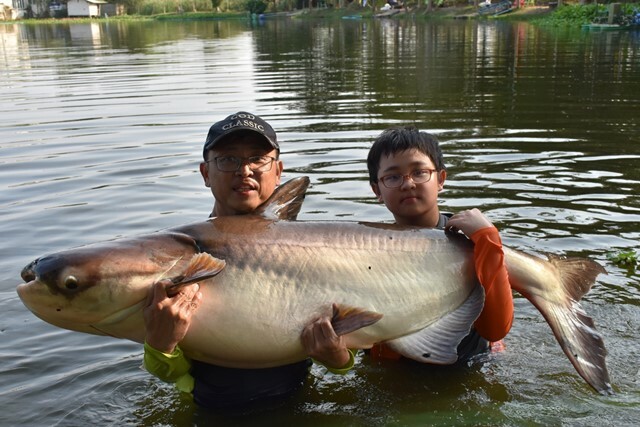 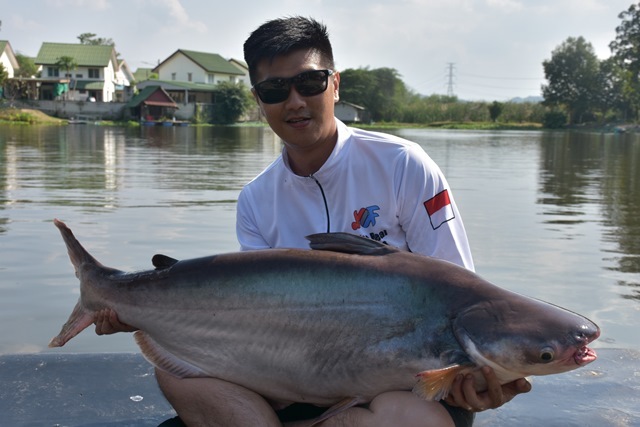 Singaporean angler Tan Peng Yeon and his son had a good day topped off by landing the friendly Mekong, they also caught striped catfish. 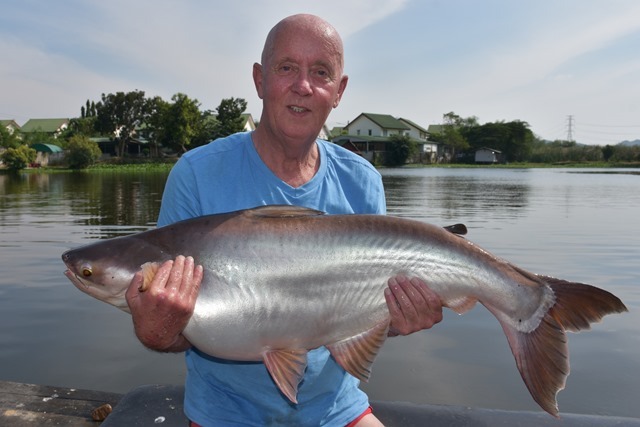 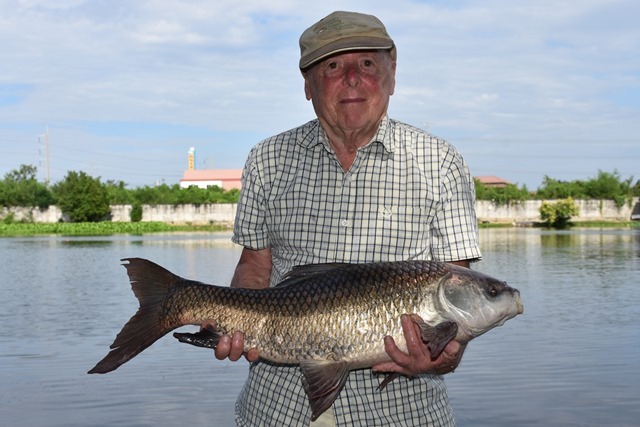 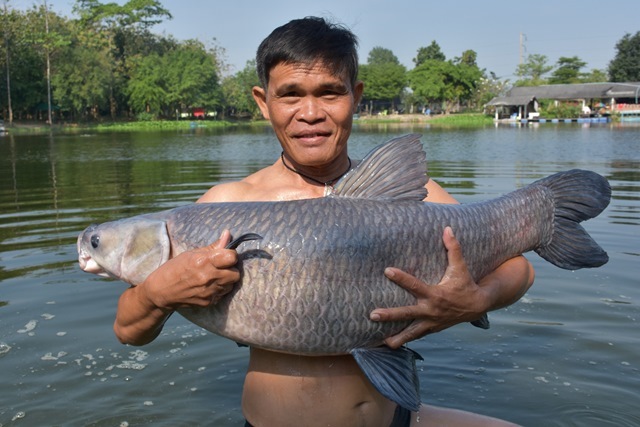 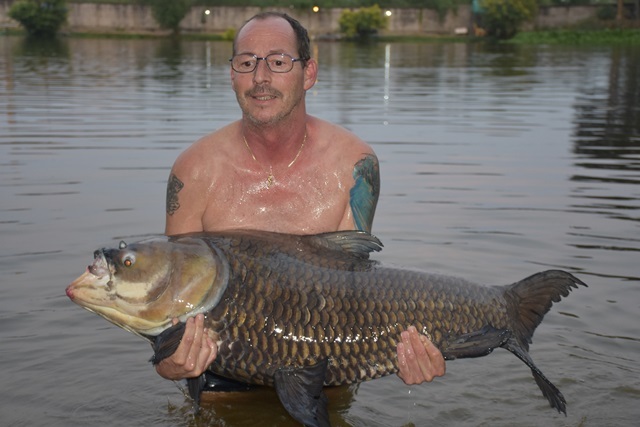 Richard Gibson had a successful first visit to Palm Tree catching Siamese carp, wallago attu and striped catfish. 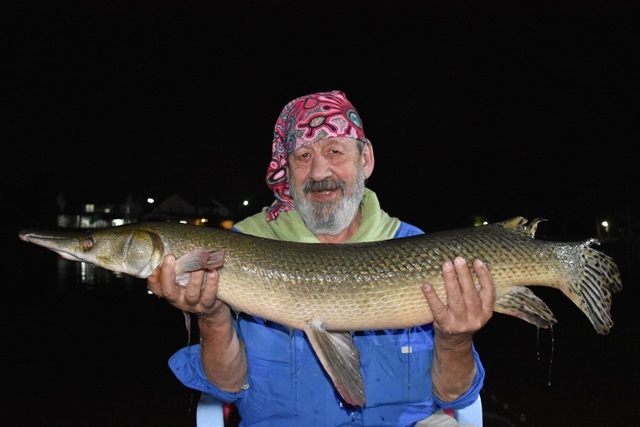 Dufero Tilek and his fishing friend returned this time catching a decent alligator gar as well as striped catfish. 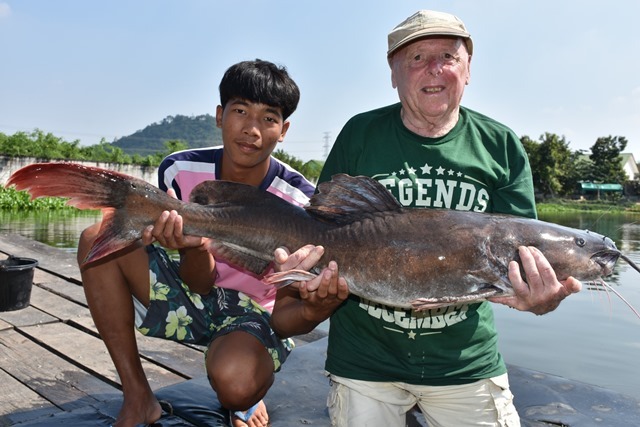 Ken and his fishing buddy came down for the day and seemed happy with their catches of Mekong catfish and striped catfish. 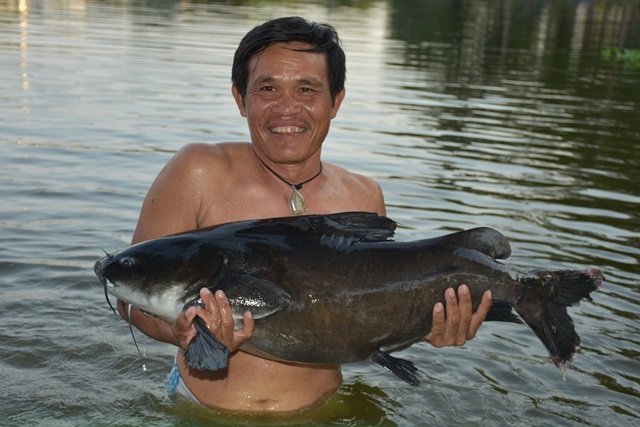 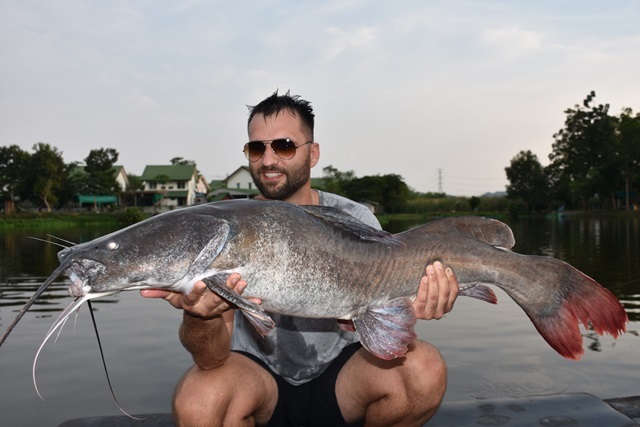 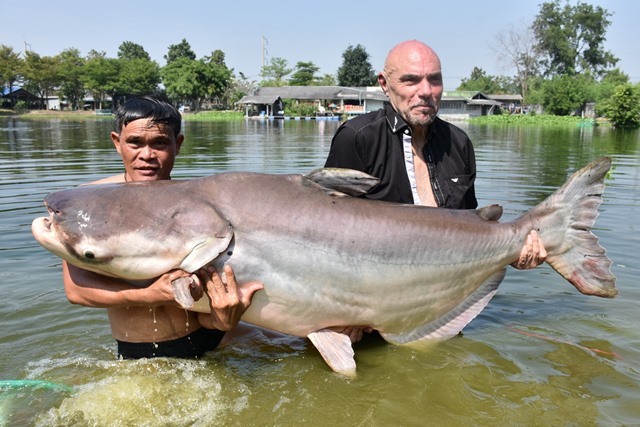 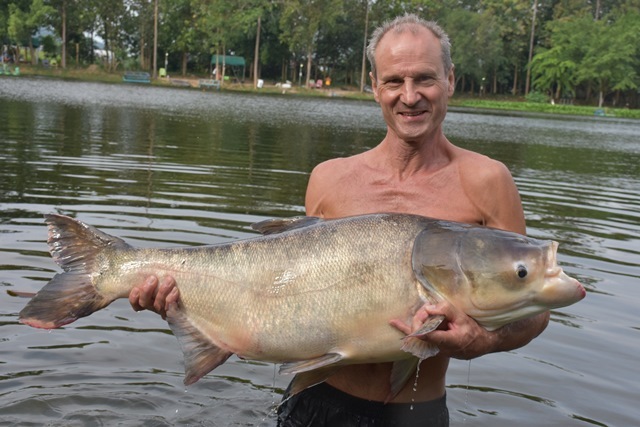 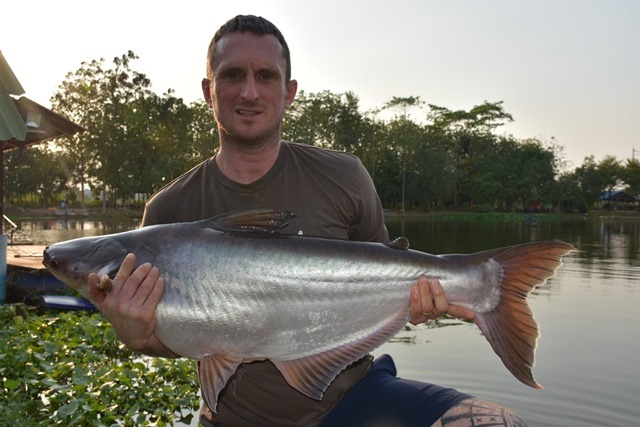 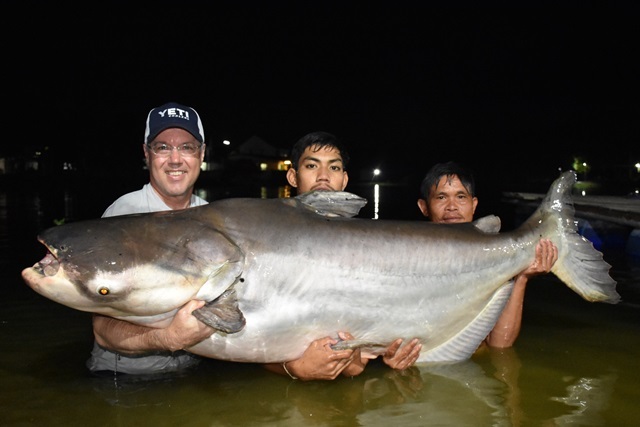 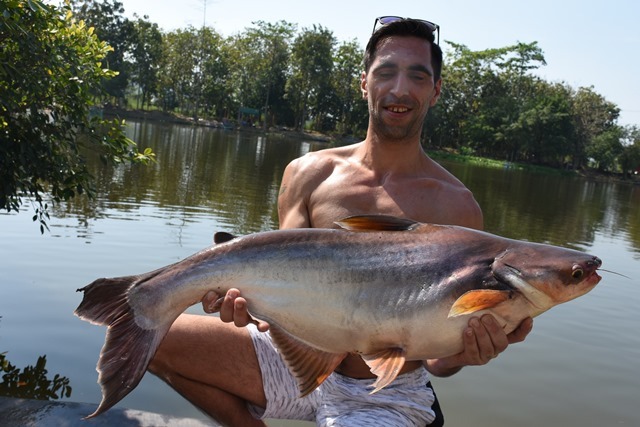 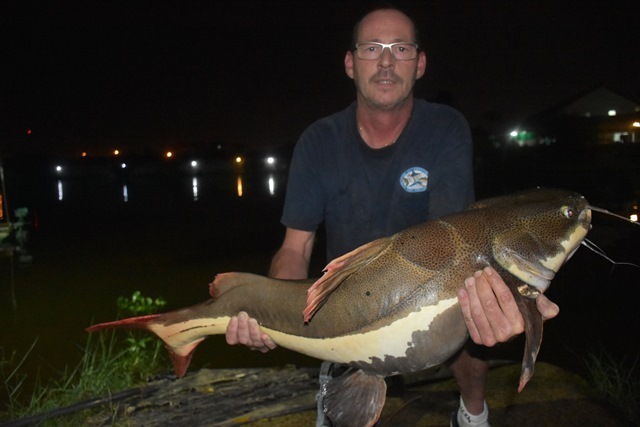 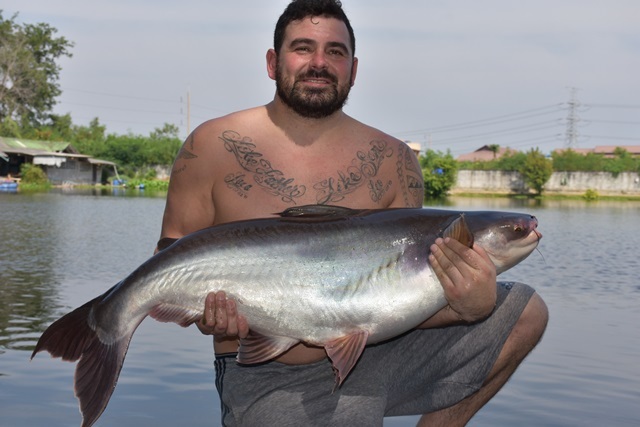 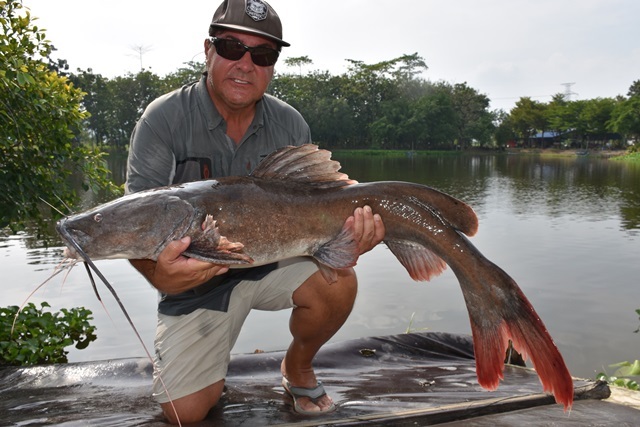 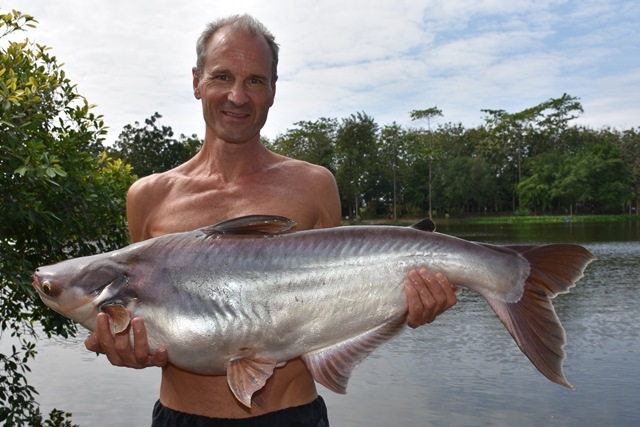 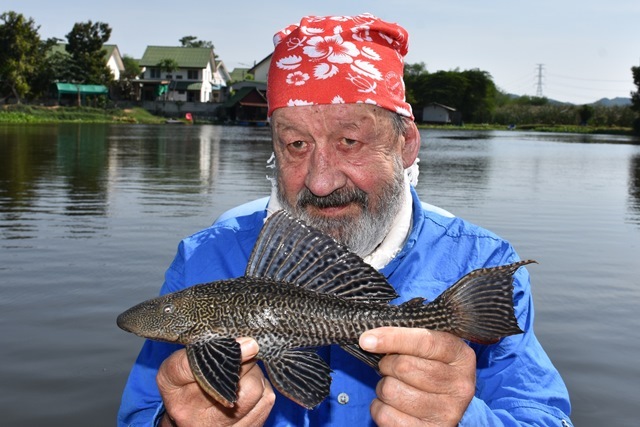 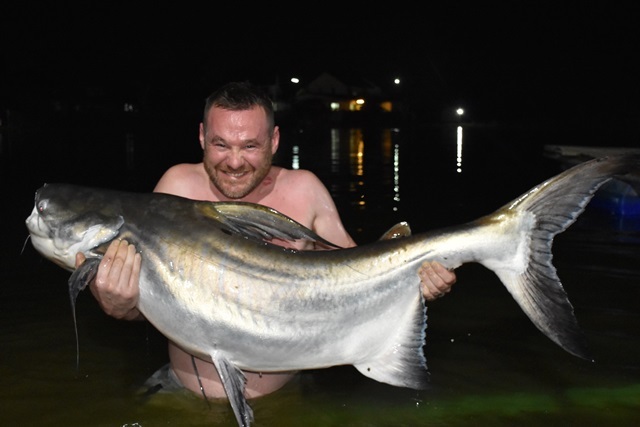 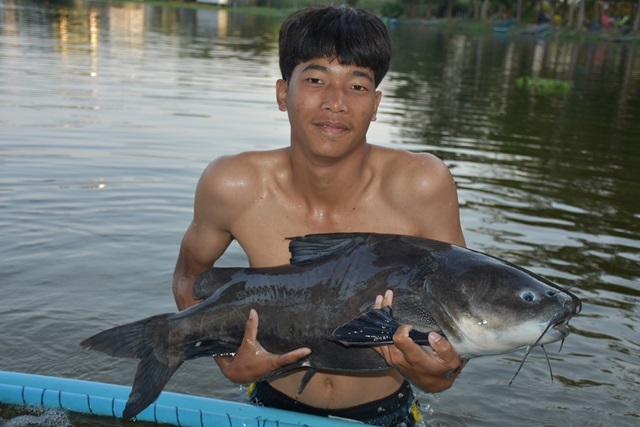 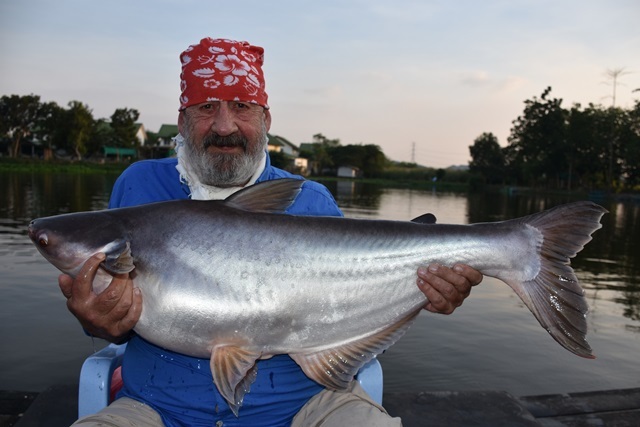 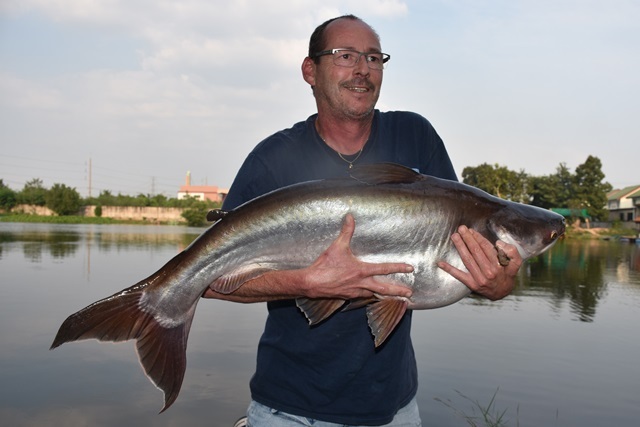 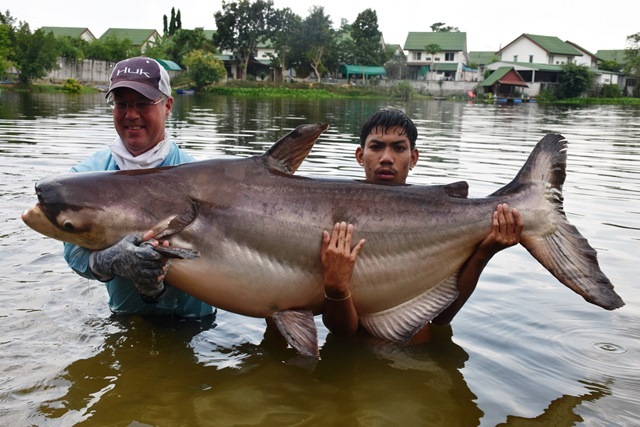 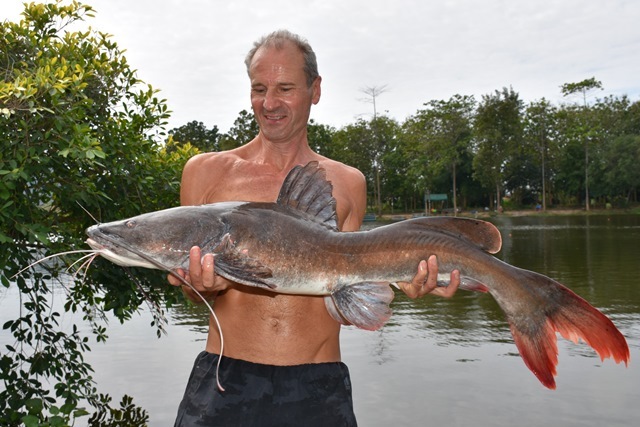 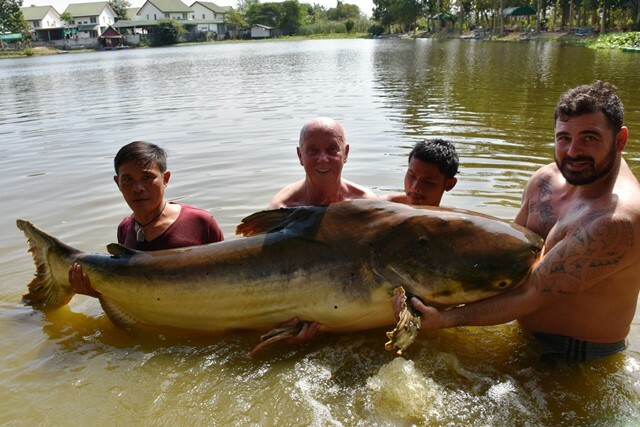 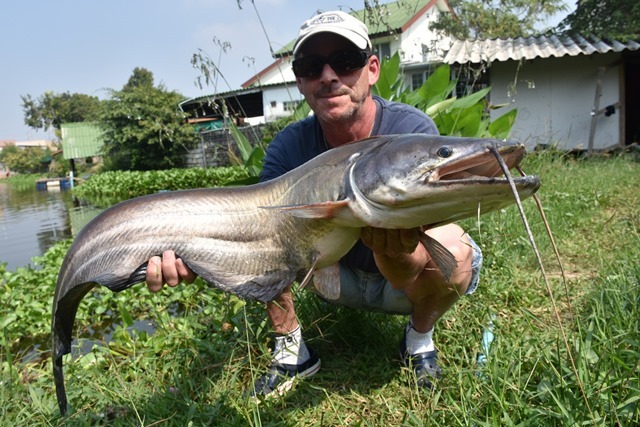 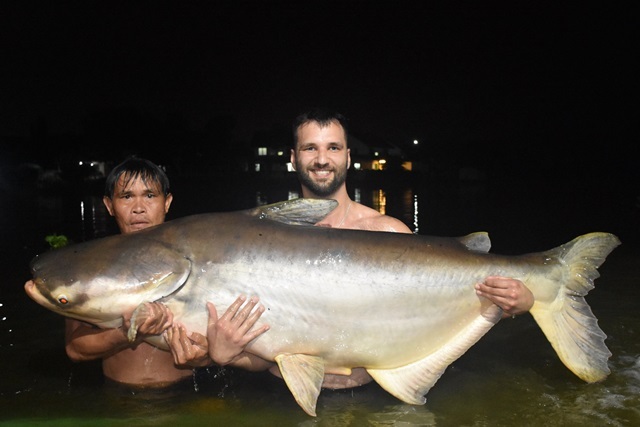 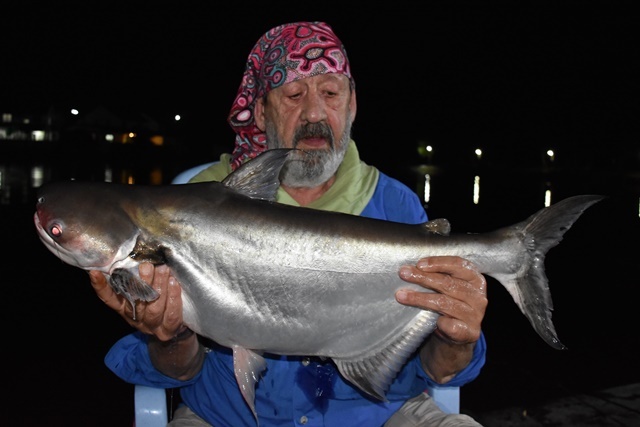 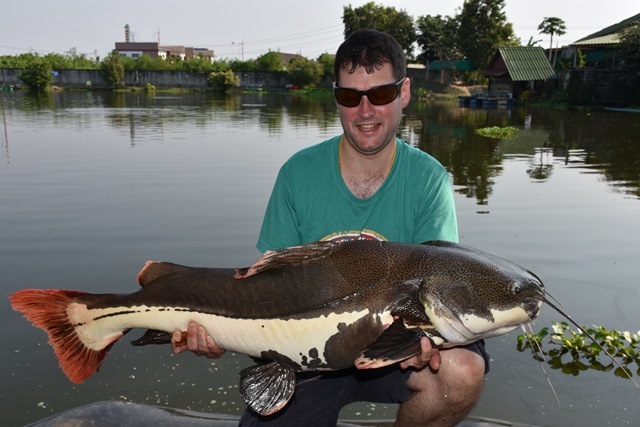 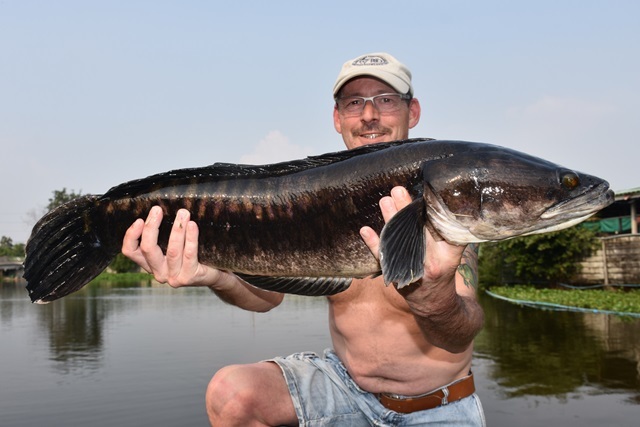 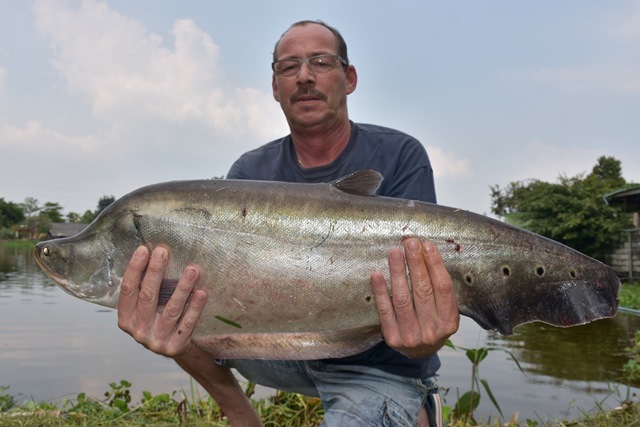 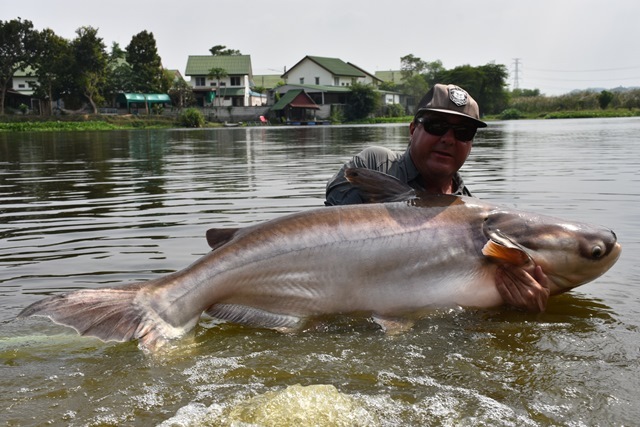 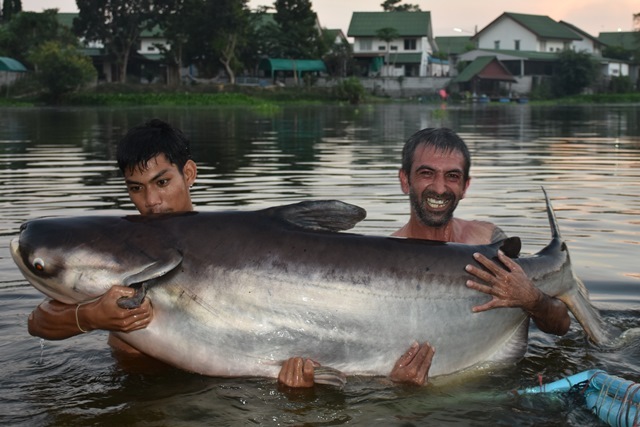 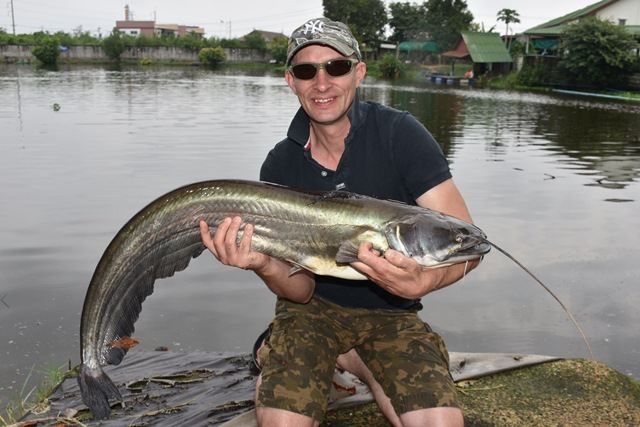 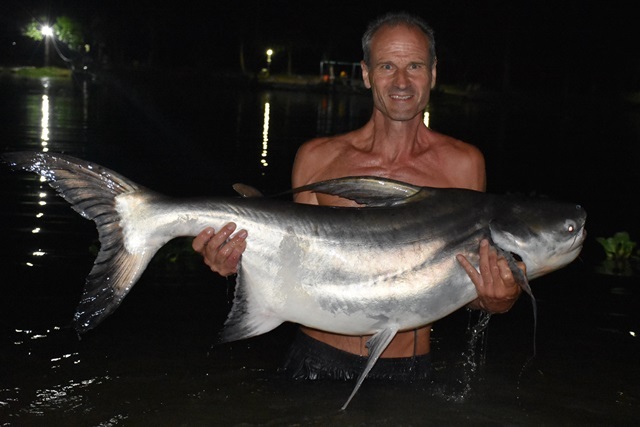 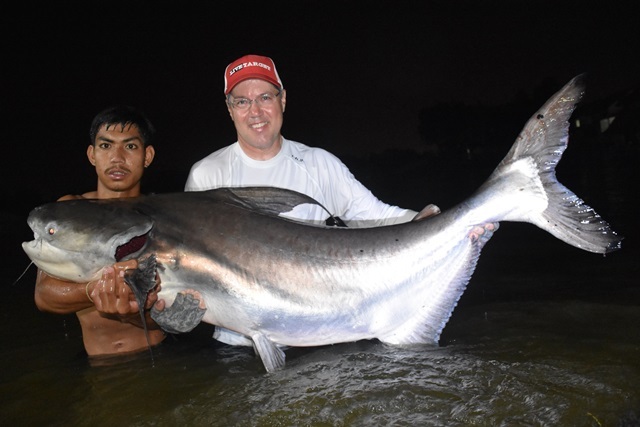 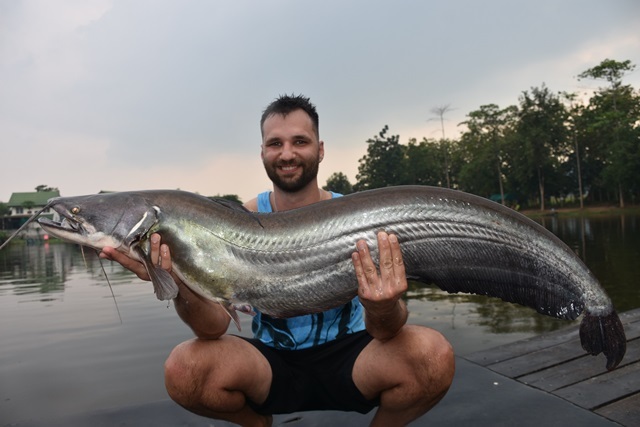 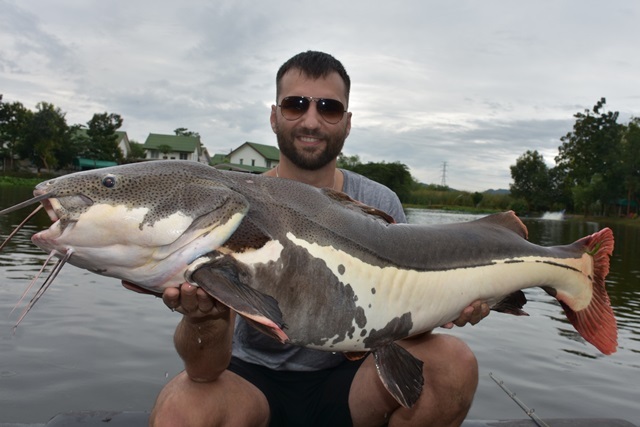 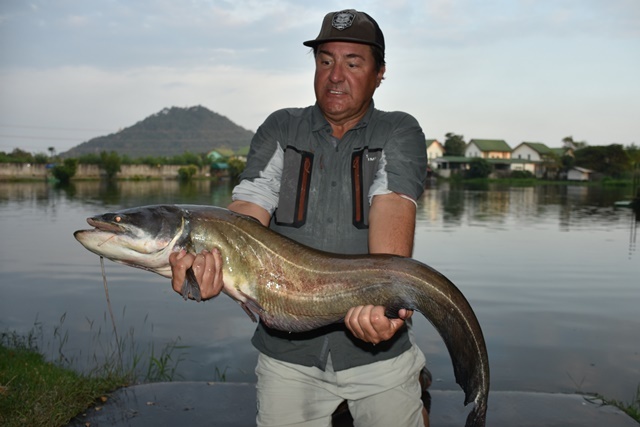 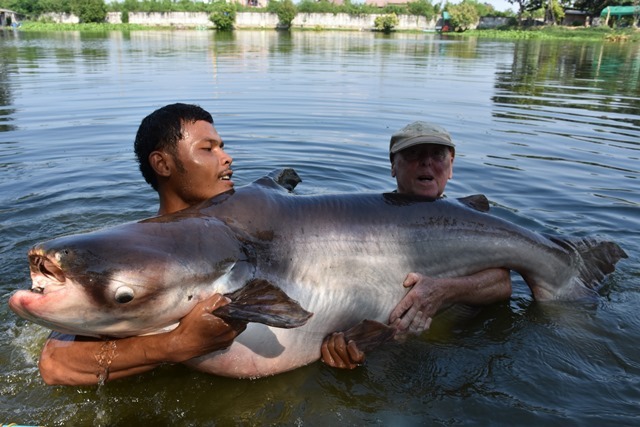 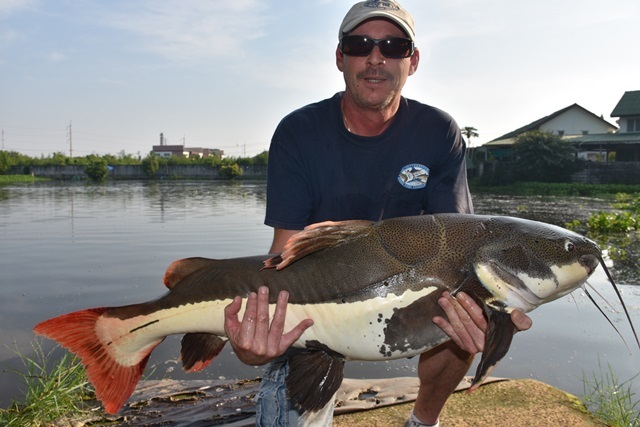 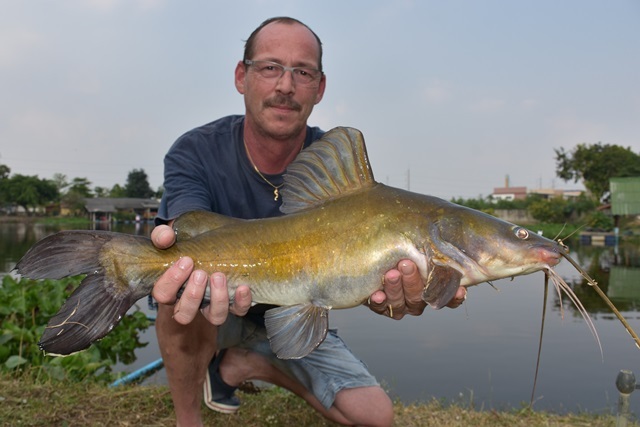 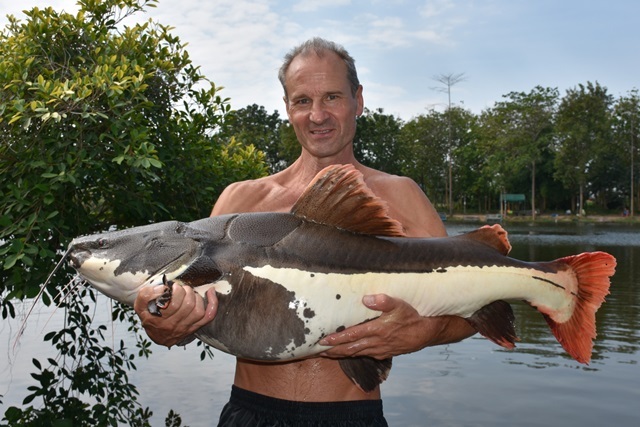 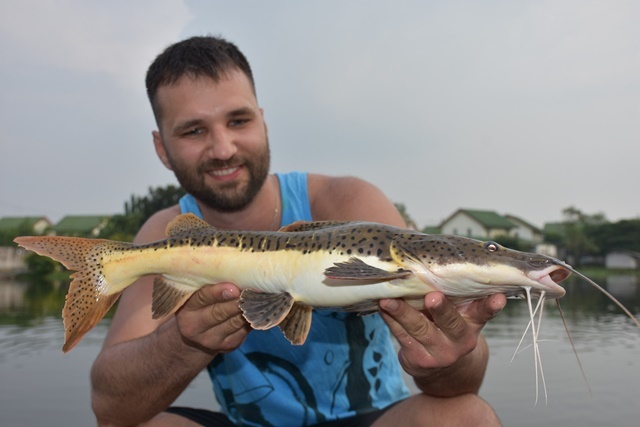 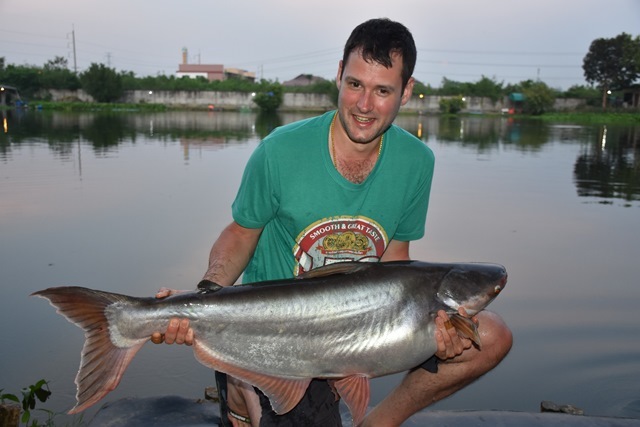 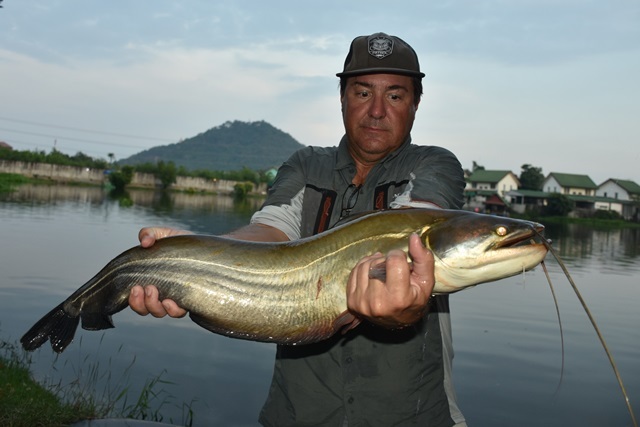 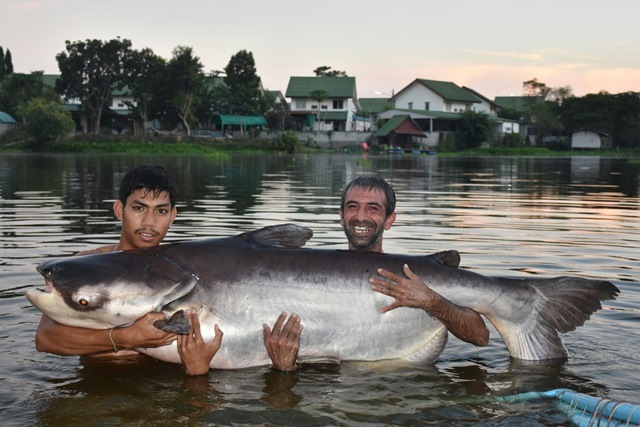 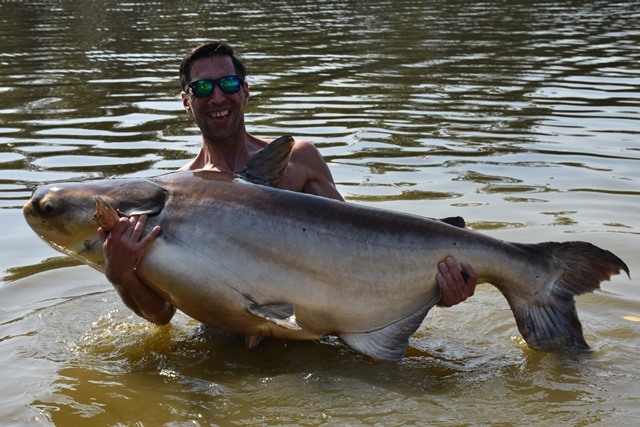 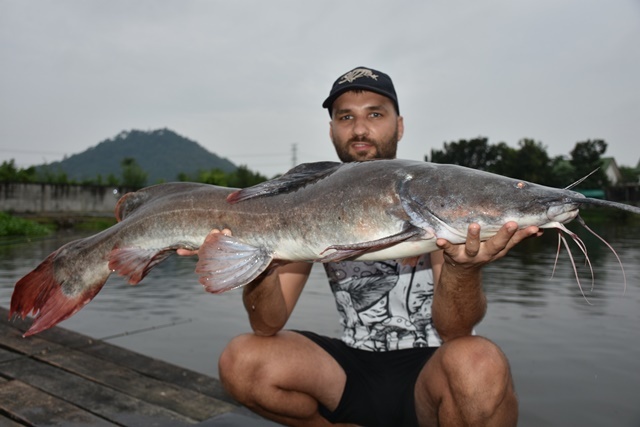 It was a quick visit for Tulio Althoff but he still managed to catch Mekong catfish and striped catfish.